The saturday here gave much the same weather: rain (at first). So instead of going to the airport I talked with the other B&B guests (most seem to stay here as a stepping stone for further travel up north, some on very adventurous trips) and I watched the tv at my cozy accommodation for another World Championship Soccer match: Portugal against England (Portugal -with that Figo creep- won by penalties, much to my dismay). The weather was warm, humid and cloudy; in the afternoon I walked around part of Frame Lake (got eaten by the bugs...) and saw a Buffalo DC-3 passing overhead... maybe that cancelled flight yesterday delivered its cargo after all. More of my stay here can be read on my travel account. Sunday morning brought the sunshine I had been hoping for and my camera sprung back in action! I was told the photo shows a Cessna Caravan (should be C-FATY, but you cannot see that from the photo) and I photographed it because it has a canoo fitted to the side; probably some of my fellow guests at the B&B on their adventurous trip, going north. 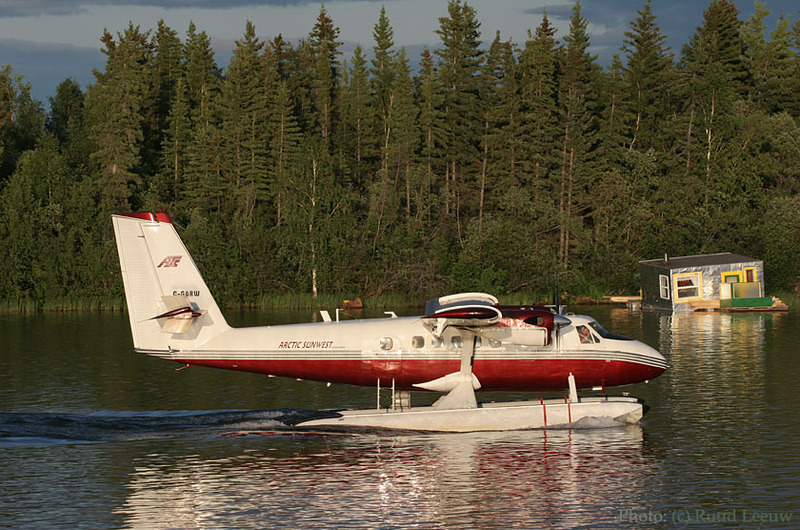 In Apr07 Air Viking of Canada announced they were going to resume production of the DHC-6. Between 1965 and 1988 over 800 had been built by De Havilland Canada. The new model would be the DHC-6-400 and orders had been booked. 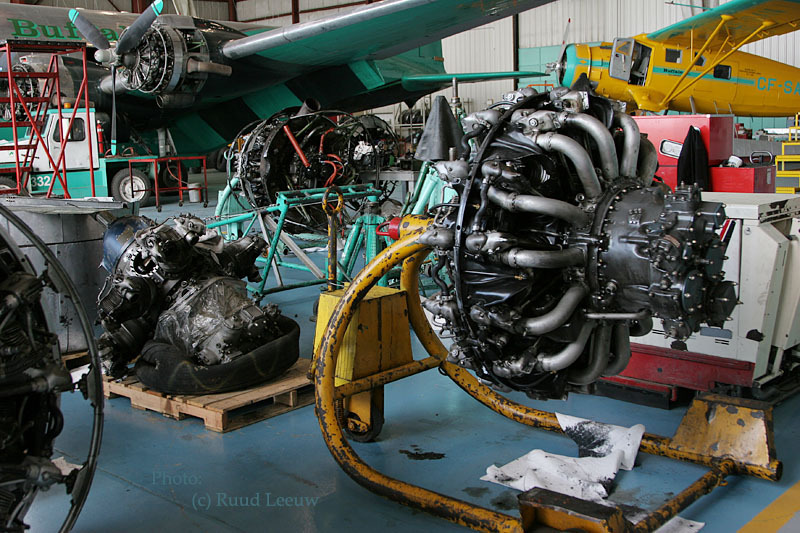 can beat the sound of radial engines! 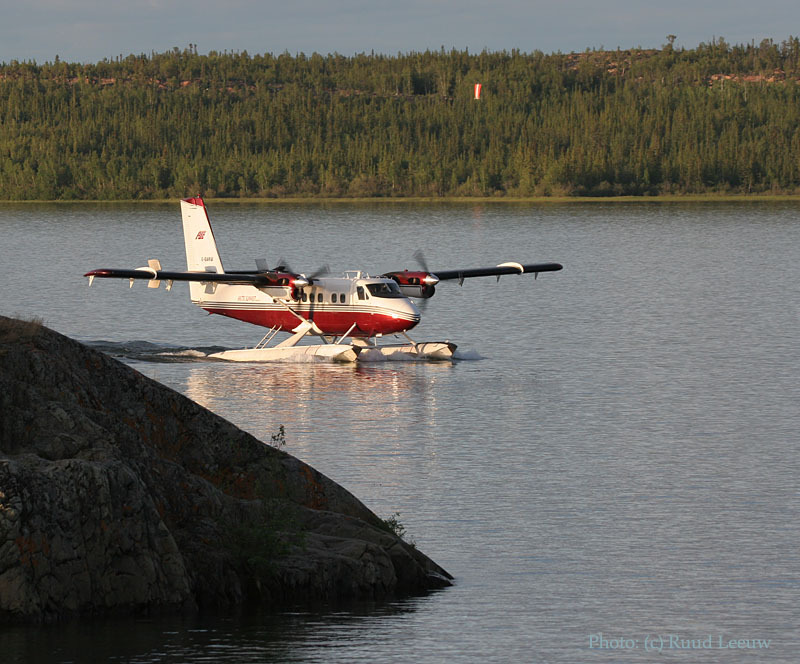 "Viking Air Limited is proceeding with plans to restart production of the de Havilland DHC-6 Twin Otter and is scheduled to deliver the first Series 400 airplane within the next 24 months. The British Columbia-based company has received orders for at least 30 airplanes. According to Viking Air, lead customers for the twin-engine, turboprop-powered STOL transport include Trans Maldavian Airlines (5 on order); Loch Ard Otters, in Palm Beach,FL. (6 plus options for another 6). Loch Ard Otters would lease the aircraft to operators worldwide. Others customers include Air Seychelles, Air Moorea, and Zimex Aviation in Switzerland, which currently operate a total of 25 Twin Otters in regional airline service. Viking Air President and CEO David Curtis says production airplanes will be built under the initial Type Certificate. De-ice capability, floats, amphibious landing gear, and skis will be offered as aftermarket options. Davis says the 'new' DHC-6 will sell for $3.2 million and be equipped with a standard 19-seat cabin and basic instrumentation. Major airframe assemblies will be manufactured in Victoria, British Columbia with final assembly delivery performed in Calgary, Alberta. 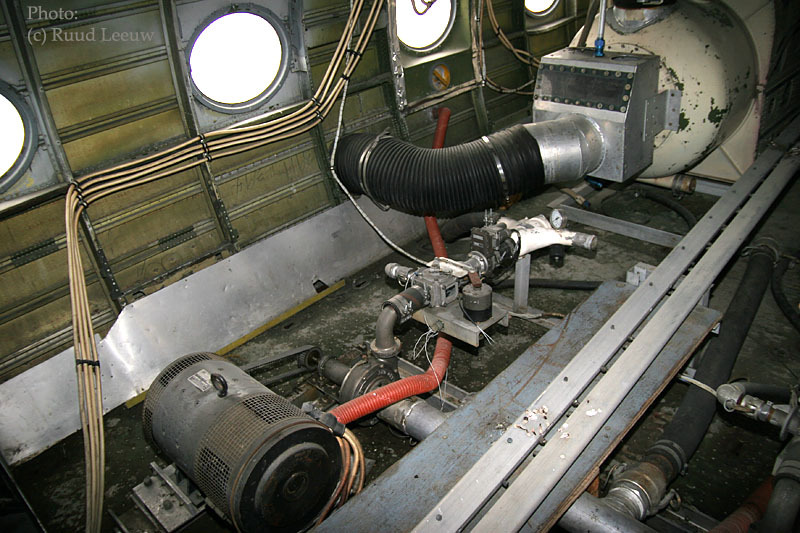 The Twin Otter Series 400 will be powered by Pratt & Whitney Canada PT6A-34 engines instead of the -27 version installed on the Series 300, originally built by de Havilland Canada. In addition, PT6A-35 engines equipped with four-blade propellers will be optional. The DHC-6 was among the earliest aircraft to equip the world's regional airlines, entering service in the mid-1960s. 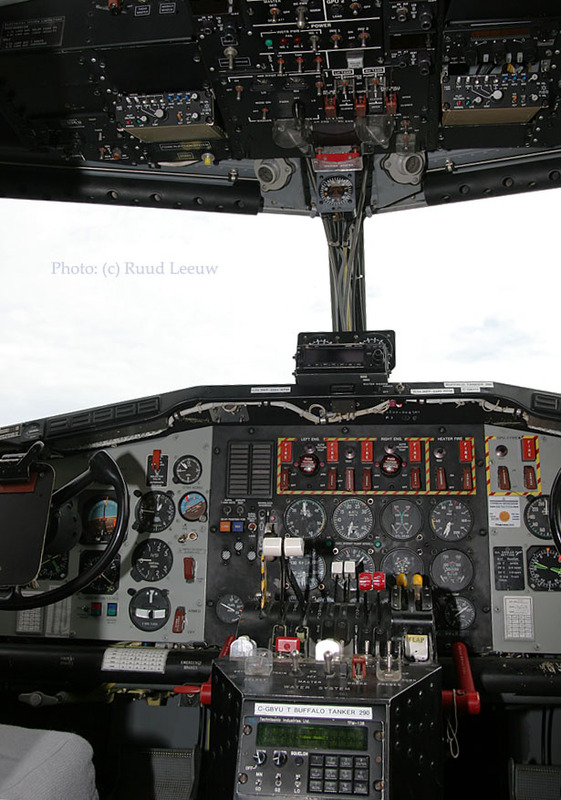 More than 800 were built from 1965 to 1988 and at least 600 remain in service, according to Viking Air. 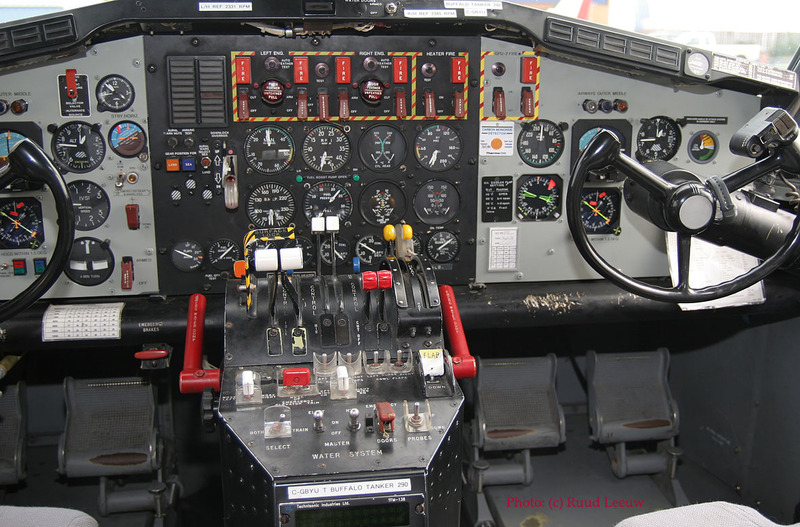 The company acquired the Type Certificate and production rights from Bombardier Aerospace early in 2006 and owns certificates for seven other de Havilland aircraft, including the DHC-3 Otter and DHC-7 Dash 7." CF-TFX (cn 13137) is a Bristol Mk.31 Freighter: not many of these around anymore! Its first registration was supposed to become G-AMRV for the Bristol Aeroplane Company Ltd, but this was not taken up. Instead it became CF-TFX for Trans Canada Air Lines ('501') upon its delivery on 30Sep53. Two years later it was obtained by Central Northern Airways (23Dec55). By merger it went to Transair Ltd in Jan56 and on 10Mar58 Wardair bought it. 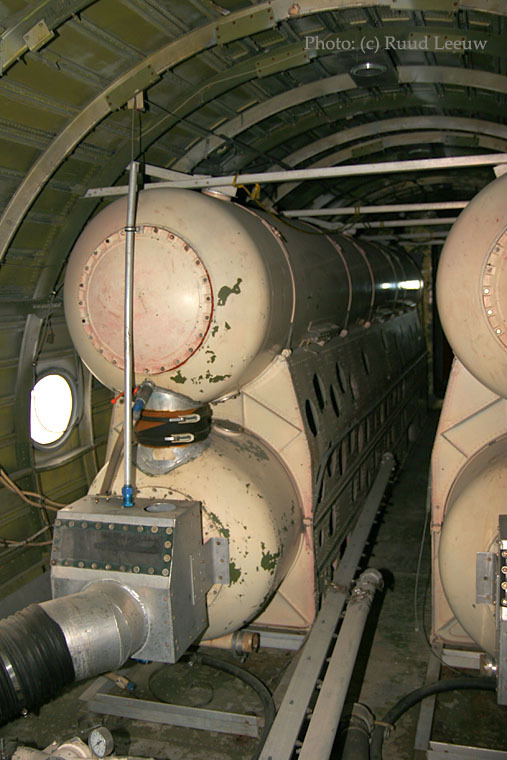 Its active career was terminated in Feb68, when it was stored. 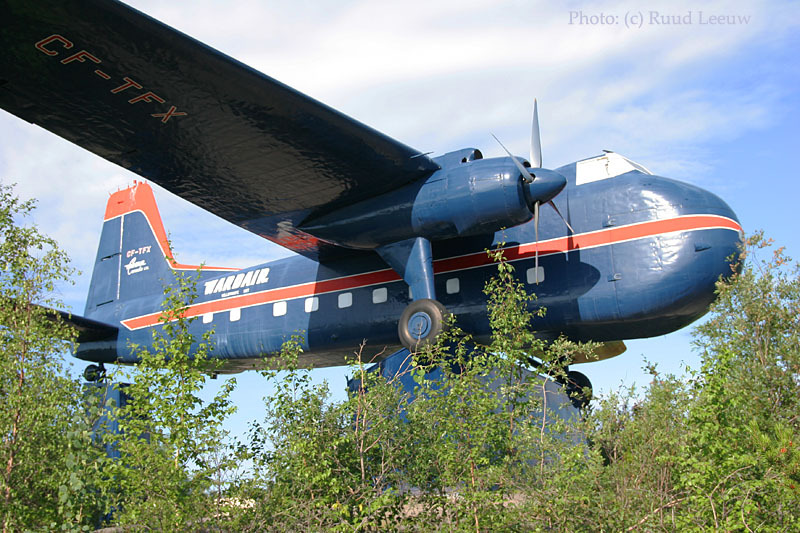 It has been preserved here at Yellowknife, to commemmorate Max Ward and Wardair. 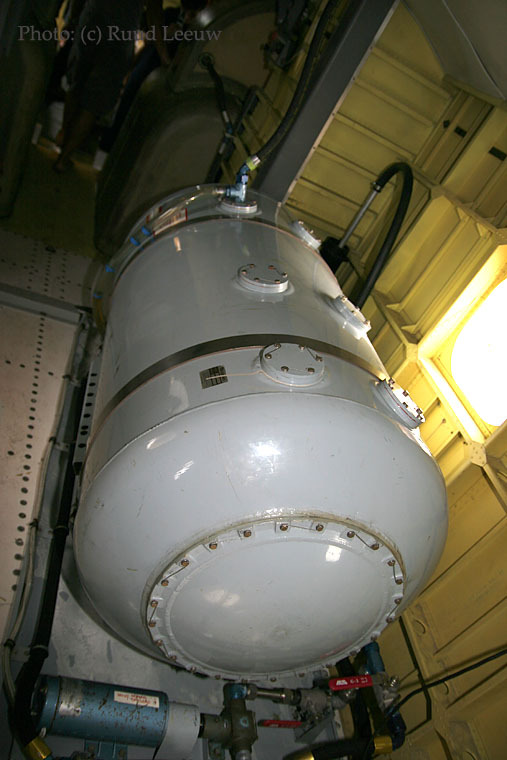 Dirk Septer added the date; "TFX was preserved as a monument on June 22nd, 1968". If you decide to visit CF-TFX: make sure you bring plenty of bug repellent! Robin Weber (Archival Technician, NWT Archives www.nwtarchives.ca) replied to my query for info on since when 'TFX has been preserved here in this way: here is a copy of the article in the YELLOWKNIFER, AUGUST 16, 1996 (pdf format) stating "bought from Wardair in 1970, later hoisted to its current location". I don't see an exact date of month mentioned, though. Bristol Freighter CF-TFX, high on its pedestal but the trees are growing higher and higher! 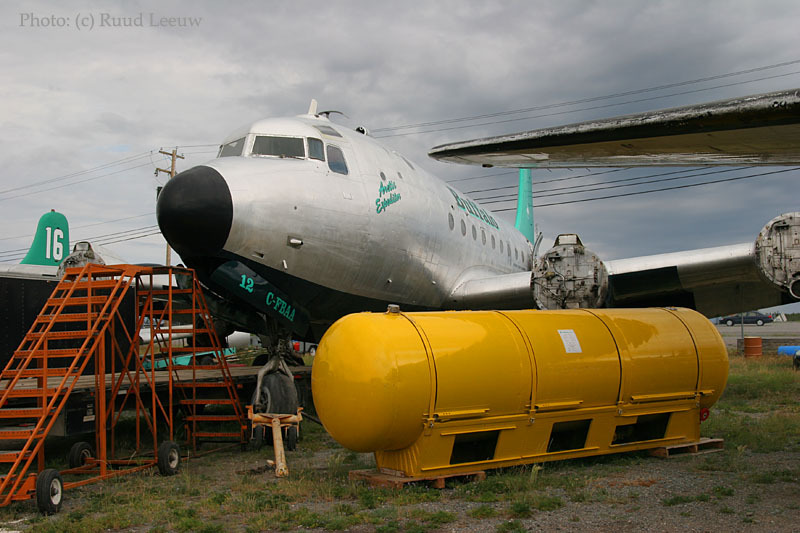 The book THE ARCTIC FOX by the man himself, Don C. Braun (co-written by John C.Warren; Back Bay Press, 1994 and a forword by Max Ward) has chapters about this very Bristol Freighter CF-TFX, its use by Wardair in the Arctic North and also a chapter about how CF-TFX became the first wheel-equipped aircraft at the North Pole (in 1967, pilot: Don 'the Fox' Braun himself!). 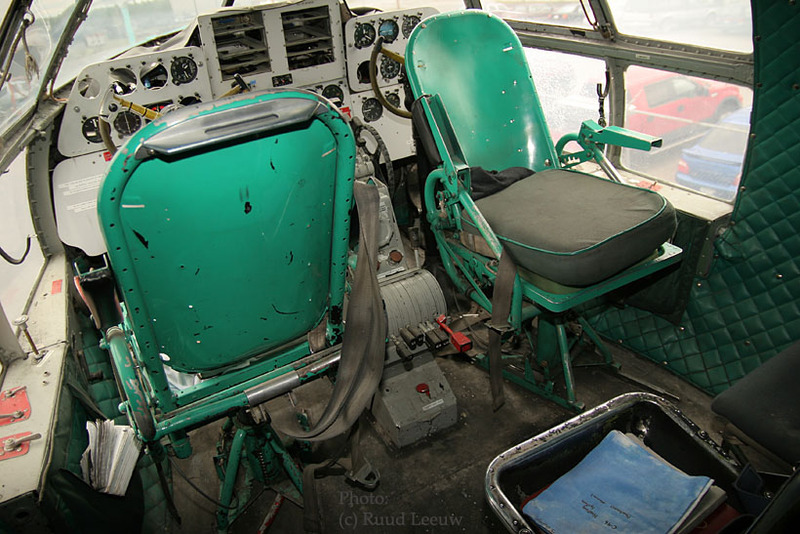 The first wheel-equipped aircraft to land on Antarctica suffered a much less dignified fate: DC-4 N44915 was scrapped except for the cockpit section. 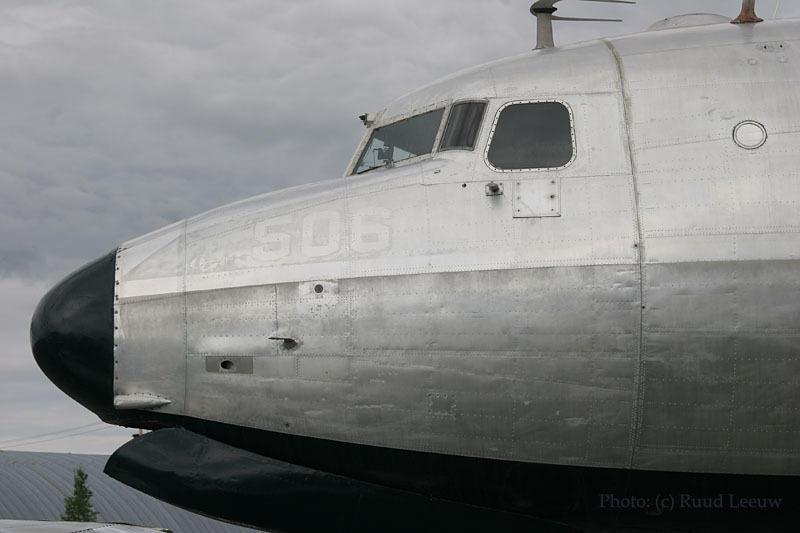 There is only one other Bristol Freighter in more or less airworthy state and I found photographed it a few days ago at the Reynolds Transportation Museum. 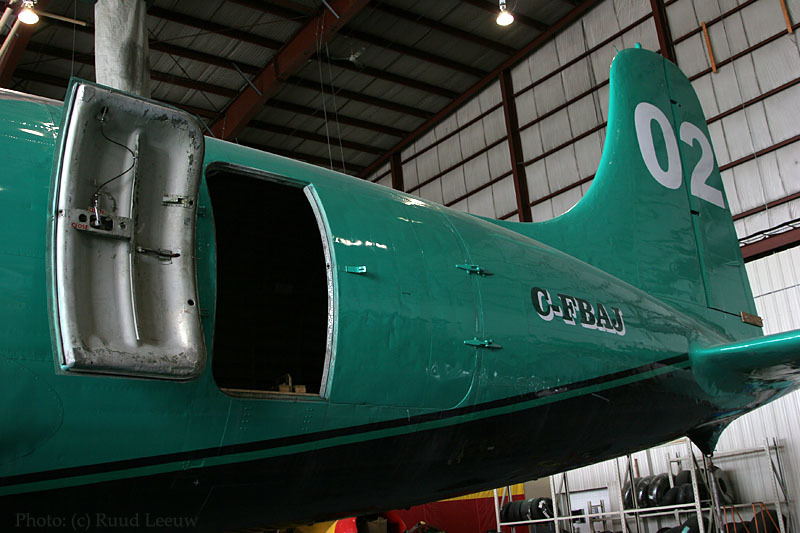 Another Bristol Freighter, C-FWAE, is preserved in Winnipeg's Western Canada Aviation Museum. Now that does look much better, doesn't it: GPNR and GWIR basking in the sunshine! 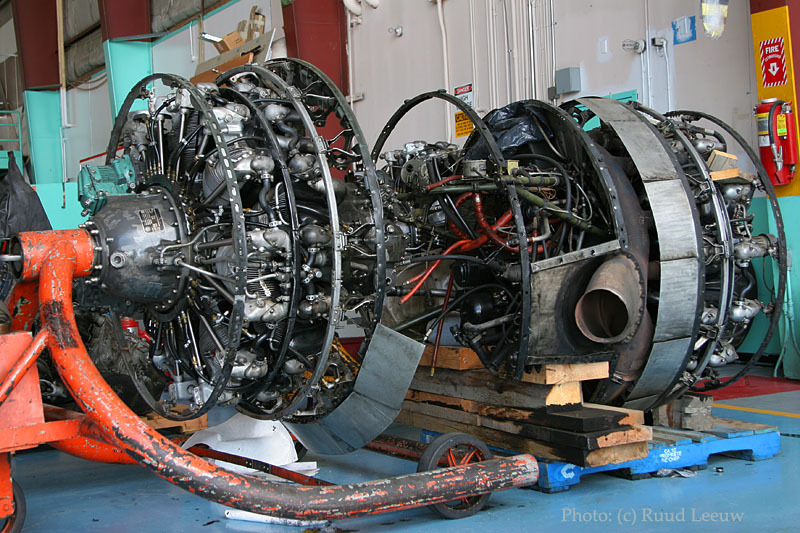 Only Ron McBryan was around, tinkering with that no.2 engine of C-GCTF, a problem to be solved: 24/7 after all ! 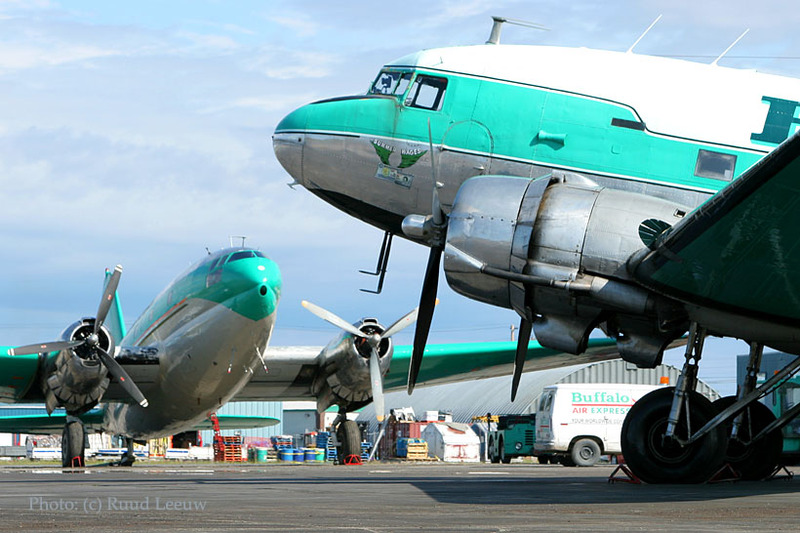 The histories of these planes have all been written out on my Yellowknife Day 1 account. Curtiss C-46 C-GTXW has been out of operation for quite a while but 2006 saw it coming back on the line, unfortunately not during my stay here. So much love for detail here, look at that lettering of a mere registration number! 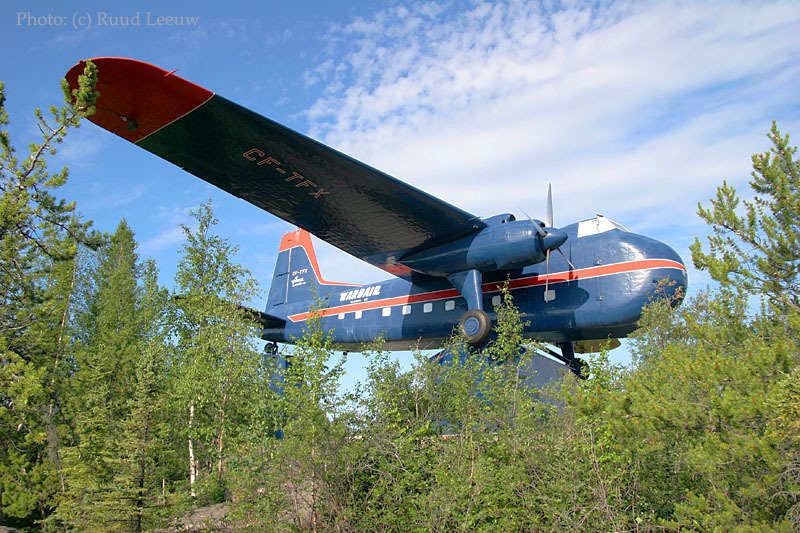 For the history details and photos of its interior: see my Yellowknife Day 1 account. "I worked for Air Manitoba and Buffalo Airways in the early 1990's. 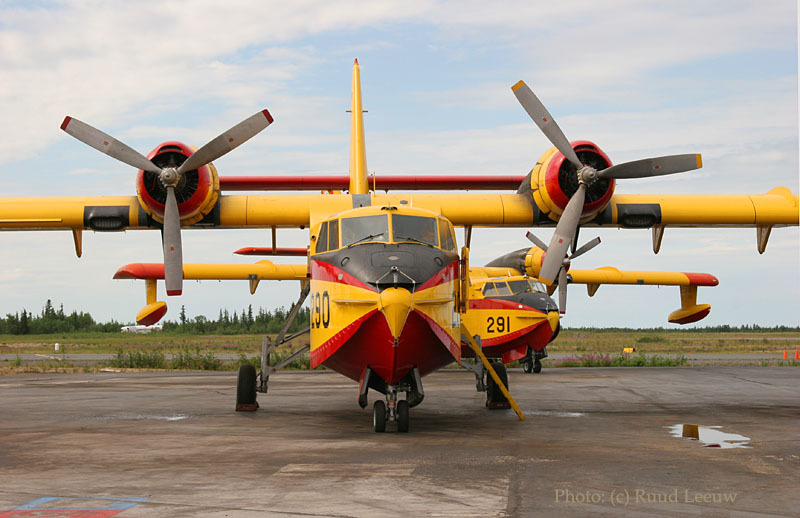 A couple of guys and myself were the ones that pulled C-GTPO out of the bush in Pickle Lake,Ontario in the summer of 1993, when Buffalo first bought it. It had a collapsed left main from going off the runway.It was ferried to Seattle for permanent repairs, then began service in Yellowknife. C-GTXW was the first airplane I ever flew on: Winnipeg to St.Teresa Point in the winter of 1991. Nothing like looking back from the co-pilots seat on a C-46 during a moonlit night with the rumble from those double row Wasps!! C-GIBX had a sister ship, C-GIXZ, which crashed in Africa after an engine failure on take off. 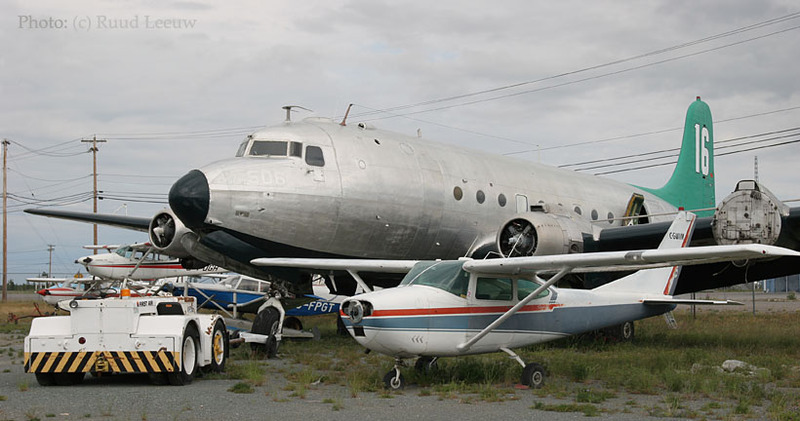 AIR MANITOBA had 6 C-46s in total, C-GIBX, C-GTXW, C-GIXZ, C-GTPO, C-FAVO and C-FFNC. 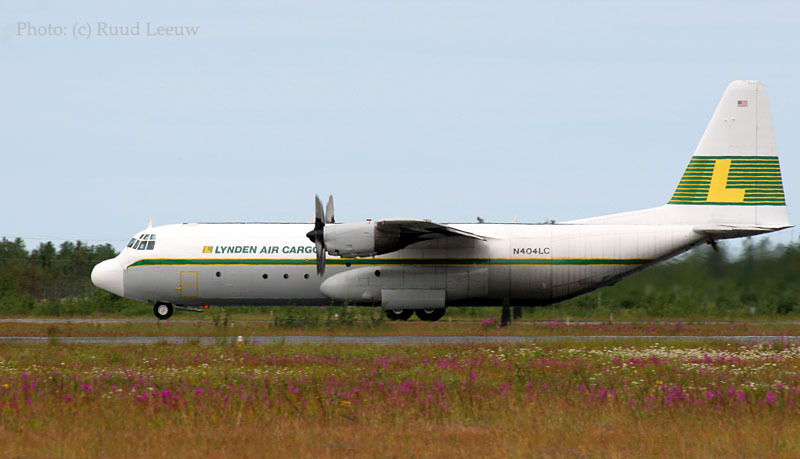 FNC was bought by Everts Air Cargo in Alaska, after it had a left engine boost pump fire during its time with Air Manitoba. It was still hauling fuel today the last I heard. TXW and FNC were my favorites. They were slightly quicker than the rest due to very little fuselage dents and wing nicks. TXW could maintain 190 knots while fully loaded and TPO and IBX did about 170. 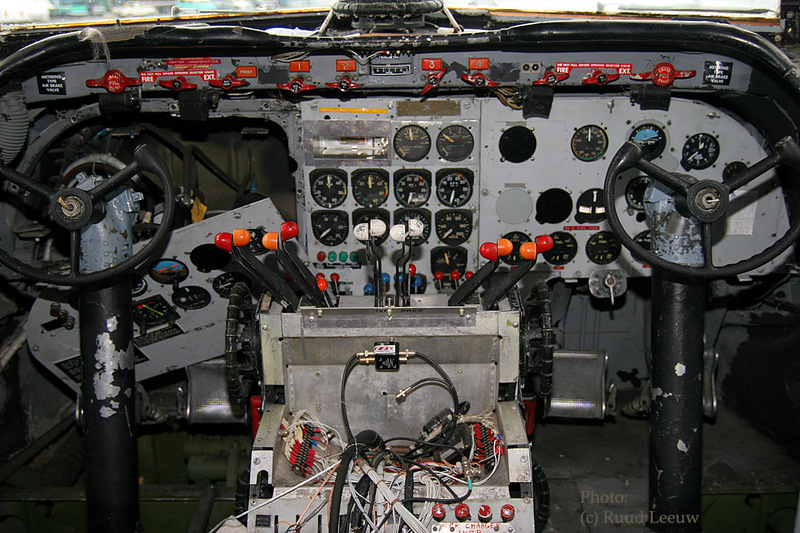 Great airplanes, nothing built today can come close to replacing them." 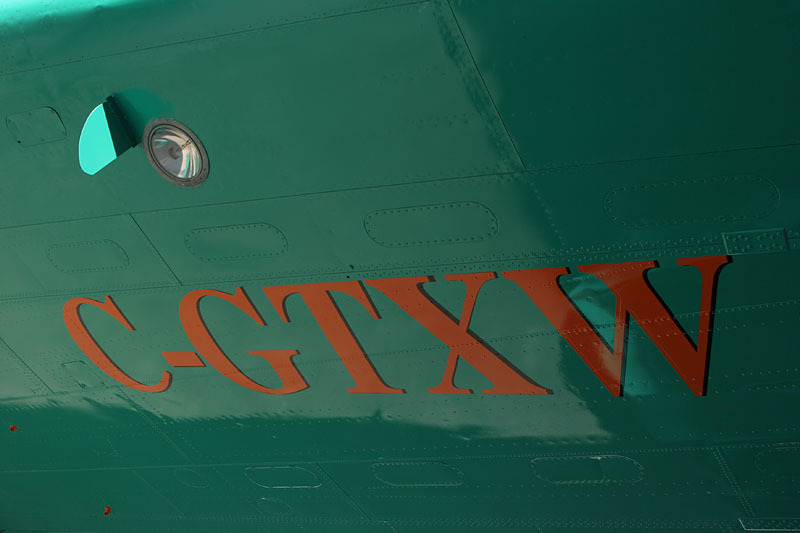 The identity of C-GTXW, as described above, was in doubt. This led to a comparison of notes and photos on Yahoo's 'Classic-Propliners' forum oct-dec.2013. Its conclusion: during the period 1960s - 1980s F.A. 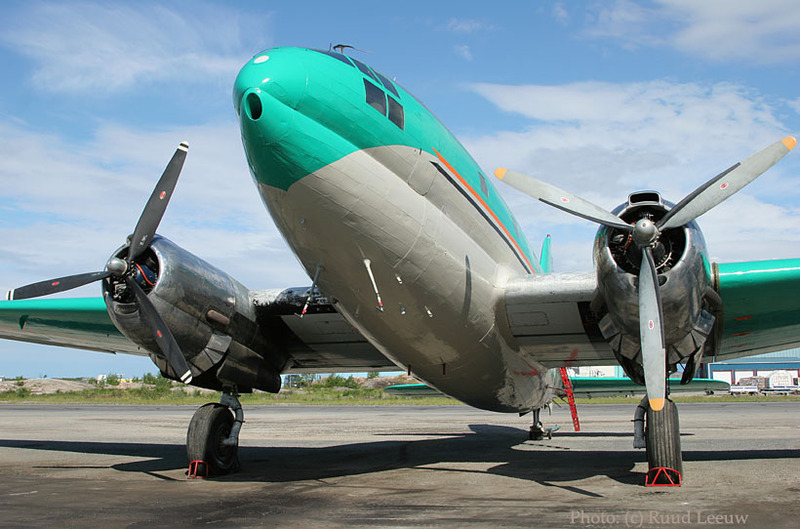 Conner at Miami switched parts and dataplates of two C-46s: HI-171 & HI-163. HI-171 is said to be c/n 30386 ex HI-145, HP-424, YV-C-ARM, YV-T-JTC and N7854B. 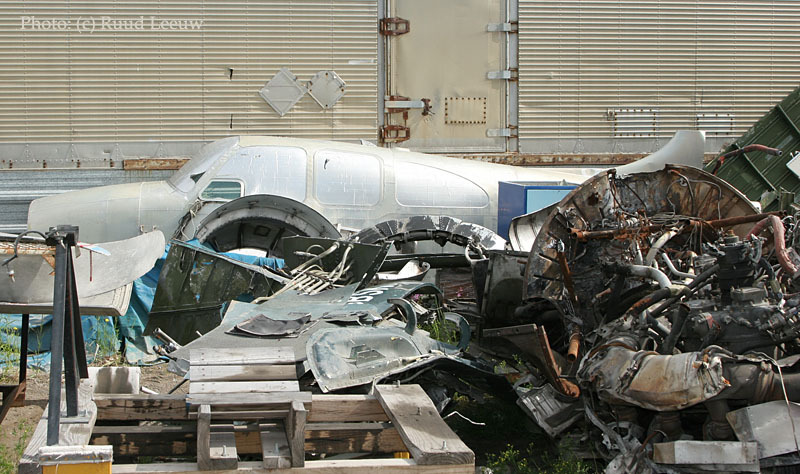 HI-163 is said to be c/n 26946 ex HP-414 and YV-C-ARV. While it was commonly accepted that HI-171 (c/n 30386) had gone on to become N4803J and C-GTXW, while HI-163 has gone off the radar and vanished; below details led to the conclusion N4803J and C-GTXW are not c/n 30386 (ex HI-171) as quoted officially, but instead they almost certainly are c/n 26946 (ex HI-163). Remarkable for the identification of these Curtiss Commandos were the propellors. 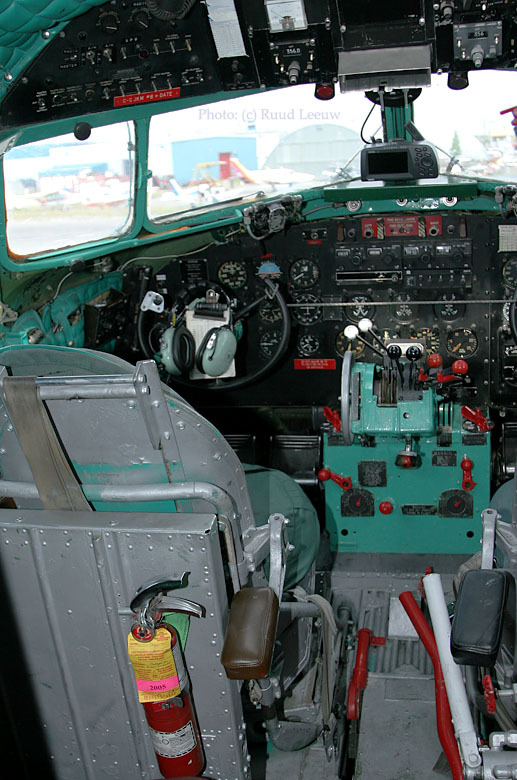 Most C-46As were built with the 4-bladed Curtiss electrically operated props. A quote in a book on the subject states: "The Hamilton 3-bladed props, installed in place of the 4-bladed Curtiss electrically operated props by every sensible operator on those C-46s equipped with the latter, are now in short supply." For years and years HI-163 and HI-171 were seen parked at Miami with FA Conner. 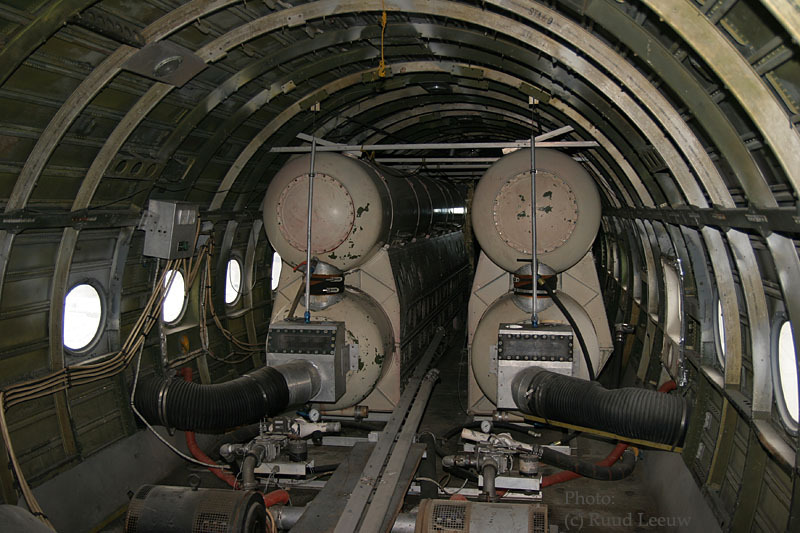 He also had about 5 C-46 fuselages in his storage yard. Most were probably ex-RANSA, which ceased ops in 1966. Francis Augustis Conner (F.A. Conner) was best known as 'Gus' Conner; his dislike for FAA Inspectors was legendary; but as a result he also had a great distrust towards aviation enthusiasts ('picture takers') snooping around. 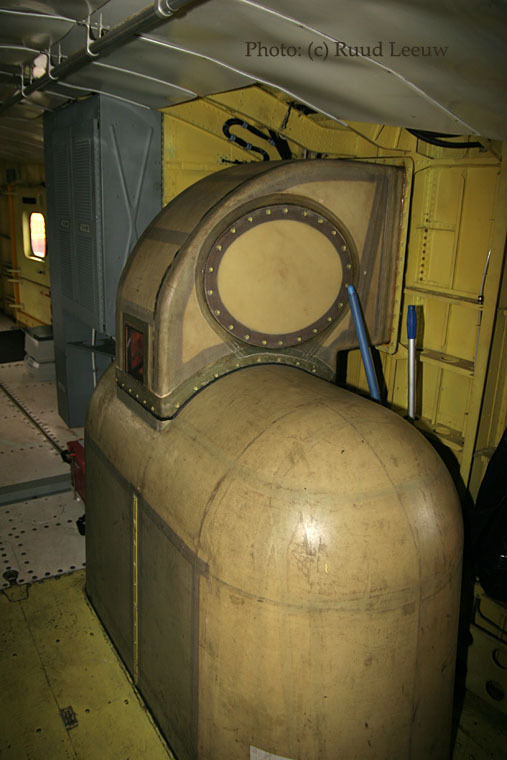 Theory: HI-163 was a pretty decent airframe (and so it was restored), but it had dodgy records. HI-171 had the undesireable Curtiss-Electric, but good records. 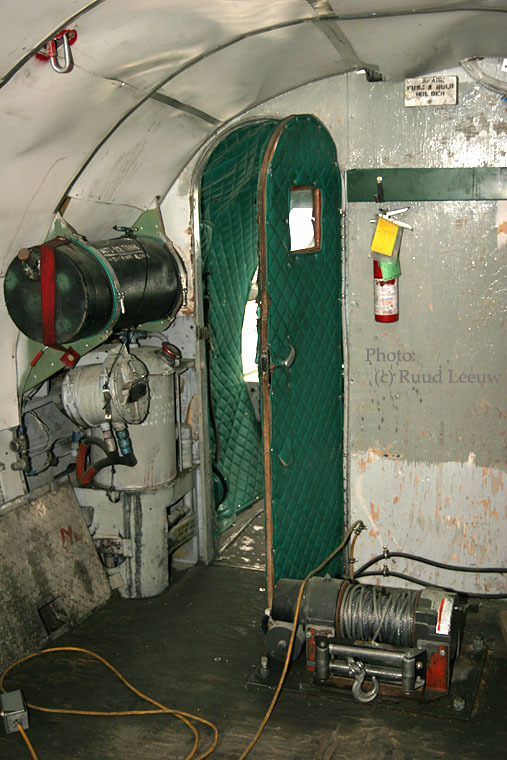 Aviation historian Peter J. Marson confirmed he has a photo of YV-C-ARV dating from 1964, and that it had the 3-bladed 'Ham Standard' props at the time. Ex Aeromar C-46 with a four bladed prop at Miami Corrosion corner, seen Mar1986 (photo C-P #22542), is definitely HI-171. 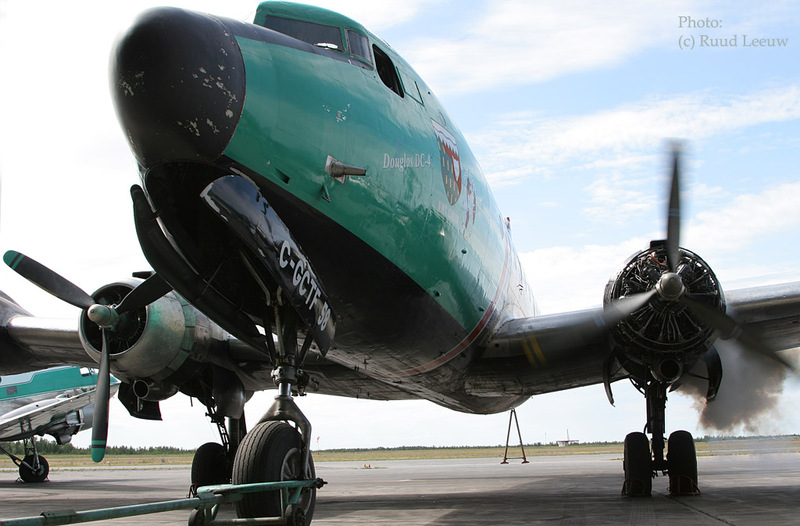 DC-3 C-GWZS is parked on the ramp at the back of the hangar. 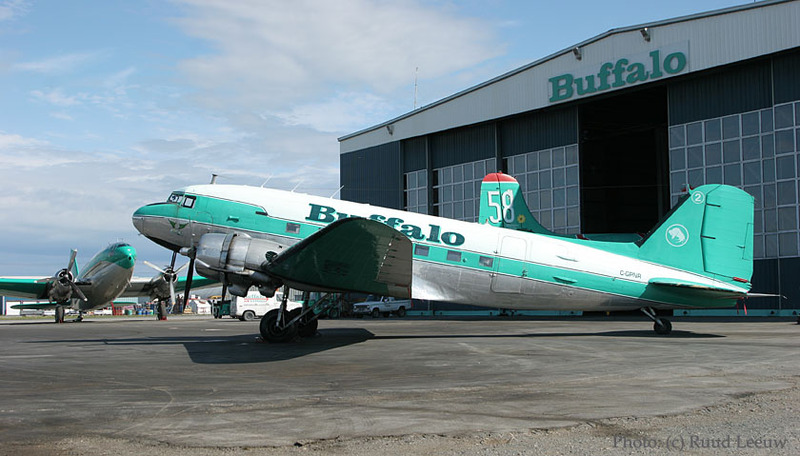 I found a profile of Buffalo Airways on Wikipedia.org ! Parked next to C-GWZS is C-GJKM. C-GJKM is c/n 13580 and it was delivered to the USAAF as 42-93645 on 11Jun44, soon transferred as KG713 to RAF Montreal on 08Jul44. It made its way to the UK but returned to Canada in 1946. On 30Jul76 it was registered to G.Wilson of Calgary. Four years later it became C-GJKM for Buffalo Air, during Oct80. 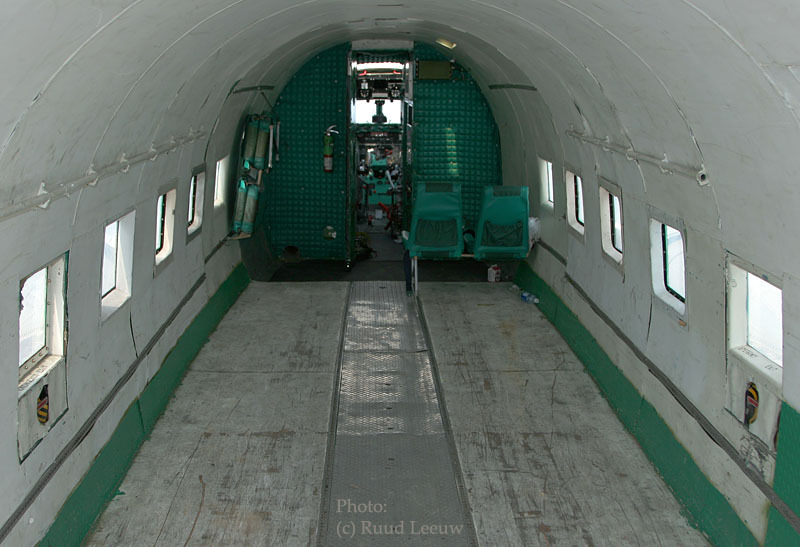 It also served with Northwestern Air, but this is/was a subsidairy of Buffalo Airways. Since 1994 it has continuously been in service with Buffalo Aws, apparently at some time it was also decorated with a '6' on its tailfin. To learn a little more about the area these aircraft operate on, see the Yellowknife article on Wikipedia.org; it also has a map and information on mines and mining in the Northwest Territories. 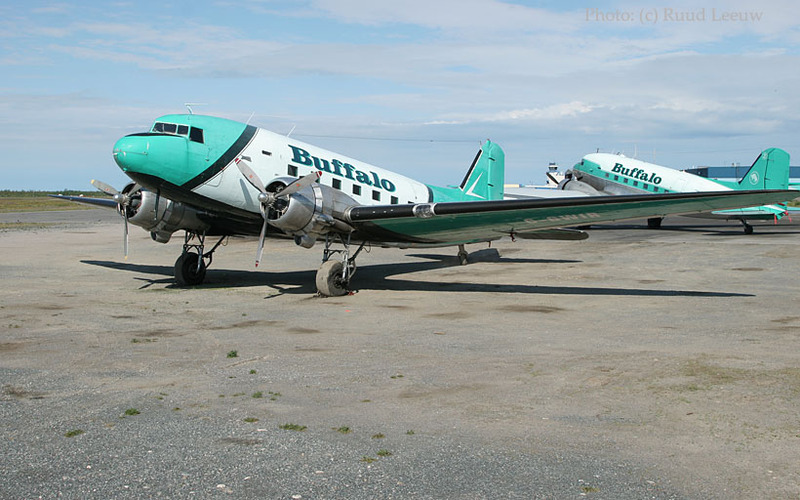 According to BuffaloAirways.com these DC-3's can haul some 6.000 lbs (2700+ kgs). 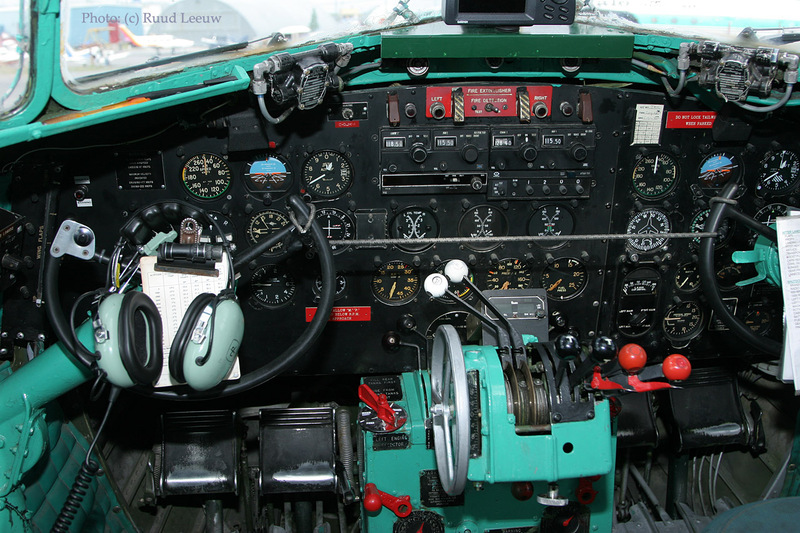 I have a page of general info on the versatile Douglas DC-3. "Around the late "70's, gold had hit the high. There was a lot of aircraft activity around Yellowknife. I spent a couple of summers (and some winter months) staking and working small claims. The work entailed blasting some rock to look like exploration work was being done or blazing a trail and marking corner posts on a new claim. One of the last of the old time bush pilots was Jim MacAvoy. I did a lot of flying with him in a old standard DHC-2 Beaver. Jim must have looked over at me and seen that "deer-in-the-headlights"-look... He yelled at me over the roar of the radial engine "can you swim?". I yelled back "NO, SO GET THIS DAMM PLANE IN THE AIR". He laughed, pulled back and up we went..! That was what the North was like then. I believe it was the end of a era for true bush pilots and real prospectors that I was able to spend time with. I do not know if Jim is remembered by anyone in Yellowknife, but he really was a legend among mining circles at that time. So that is another of my little stories of the North. Sure did, Ken! 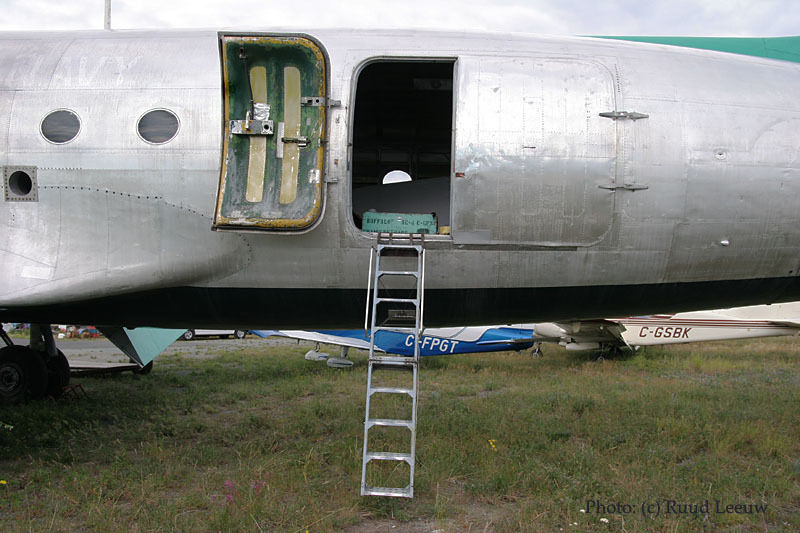 (See also Ken's photos on Abandoned Plane Wrecks of the North and Photos by Friends & Others). Jim McAvoy had a brother, Chuck, who disappeared on a flight on 09Jun64, only to be found by accident in 2003. details here. And more details on Jim's career would be welcomed! Chuck McAvoy took the Fairchild 71 up into the Barren Lands to move two prospectors and all their gear. He and the propectors and the Fairchild disappeared from the face of the earth and were never seen again. Jim MacAvoy passed away on 21Nov2009. 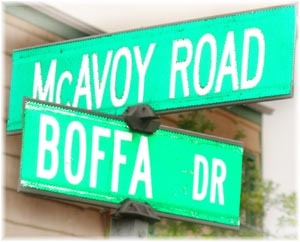 MCAVOY, James (Jim) (b. 17Sep1930) - One of the renowned northern bush pilots, Jim passed away peacefully at this home outside of Thorsby on Saturday, November 21st. He leaves to mourn his wife of 58 years, Betty, children Lynette, Jim and Jack, his grand- and great-grandchildren. Jim's flying feats were legendary in the north. He obtained his pilot's license at the age of 16 and flew the skies over the N.W.T. until he retired to his acreage south of Thorsby. His life revolved around flying and he was an avid supporter of the Edmonton City Centre Airport and its importance in aviation history. In his later years, he was a devoted grandfather and great-grandfather. Donations may be made in honor of Jim's memory to the Alberta Aviation Museum. I love snooping around...! They should give guided tours here: what is that wreck there, another Beech Baron? (Little did I know that the popular tv series Ice Pilots would lead to just that at Yellowknife: guided tours!). Of course, when the series Ice Pilots aired for a number of years, the popularity here increased and tours did become the thing to do here! C-FBAA / 12 Douglas C-54D C-FBAA has c/n 10653. It was delivered as 42-72548 to the USAAF on 03Apr45; the US Army Air Force was renamed US Air Force (USAF) and its registry was revised acordingly on 18Sep47. 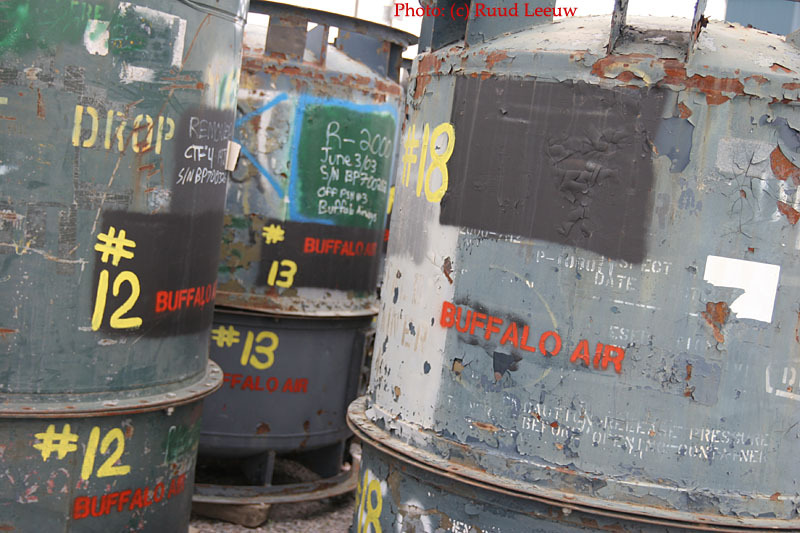 It was stored in the desert of Arizona, on Davis Monthan AFB during Oct71. On 18Oct78 it was registered as N4994H for Aero Union Corporation and converted for use in a new role: that of aerial firefighting. And so it became 'Tanker 12'. I saw it at Chico,CA in 1996, when it was for sale by Aero Union. 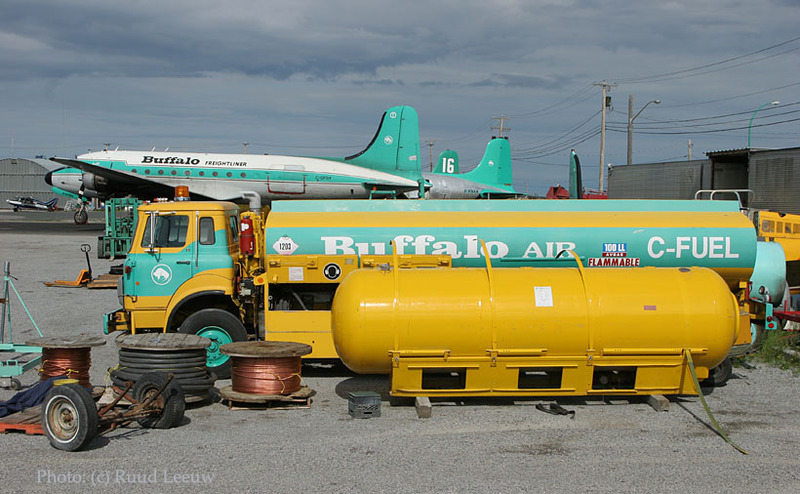 It became CF-BAA for Buffalo Airways in April 2002 (my own records record a purchase and ferry flight in 2001) and in spite of this recent purchase it has been stored here at Yellowknife, after spending a period at Red Deer,ALB. C-GBPA / 16 has been stored, but could be made to work probably..? 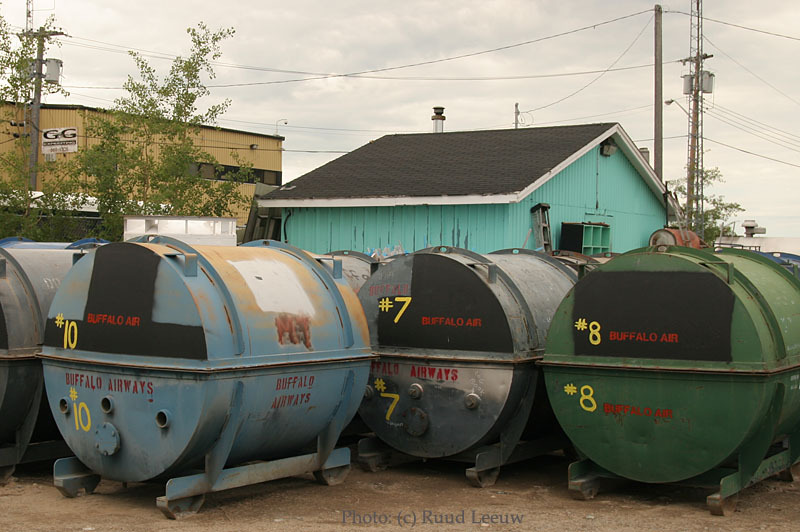 For its history details (and more) photos see my Yellowknife Day 1 account. 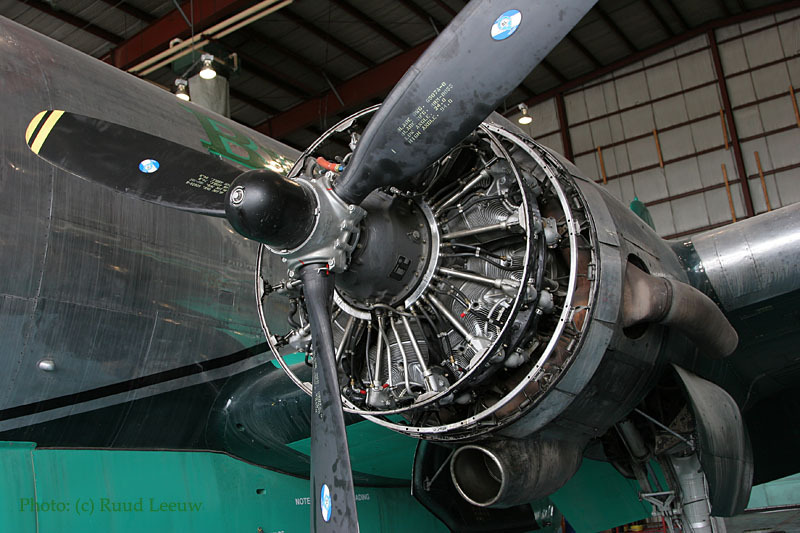 For general information on the Douglas DC-4, see my DC-4 Info Page. 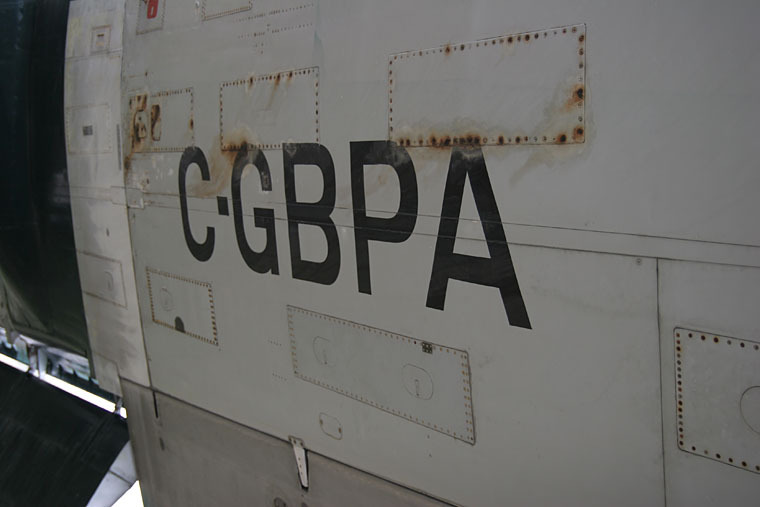 C-GBPA was reported in August 2010 as having been taken out of the storage area, into the hangar, and work was being done on it! 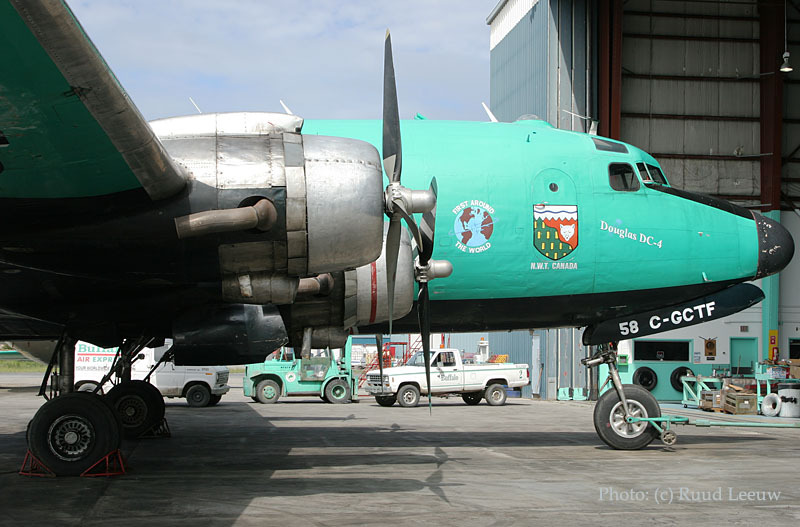 Buffalo's DC-4 C-GBPA / Tanker 16; old markings,'506',peeping through.. The Lufthansa 'Crane'-symbol survived on 'AVO when it was operated by Air Manitoba in the late-1980s; retaining the Lufthansa insignia in spite of Buffalo's fine livery was Joe McBryan's idea and I applaud it ! This C-46 was delivered as 44-77846 to the USAAF during Feb45 (USAAF becoming USAF on 18sep47). It was probably stored somewhere for a number of years as I doubt whether the USAF continued to fly it until 1961. 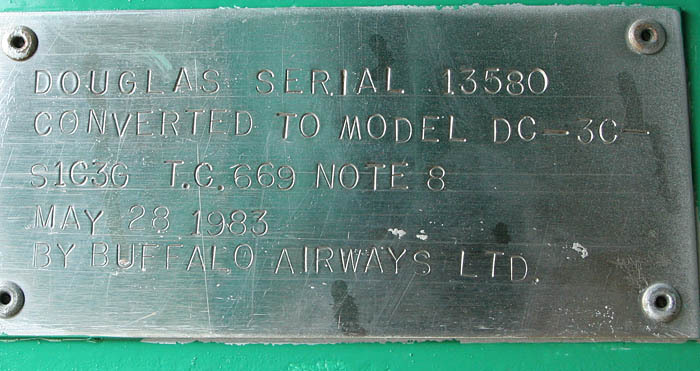 N9891Z was its first civil tailnumber, Capitol Airways obtained it on 08feb61. Lufthansa of Germany leased it in March 1964 and Capitol Aws had it returned in Nov69. So that is when it had the insignia applied! Shamrock Airlines purchased it on 12jan73 and at first I assumed this meant it continued to operate in Europe, from Ireland. 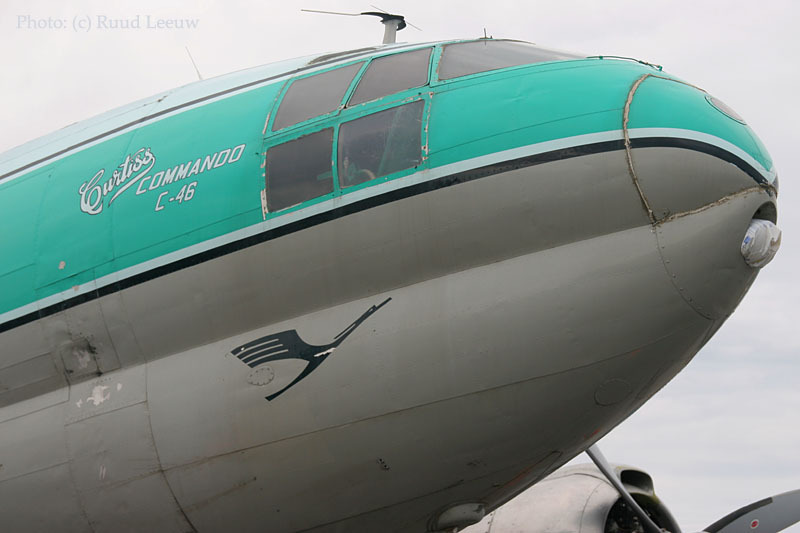 But Fred Austin (retired captain, formerly flying for/on Intermountain/C46, Rosenbaum/C46 and Zantop/DC6) corrected me: "Shamrock Airlines, was a US commercial operator base in Atlanta,GA in the early 1970's. 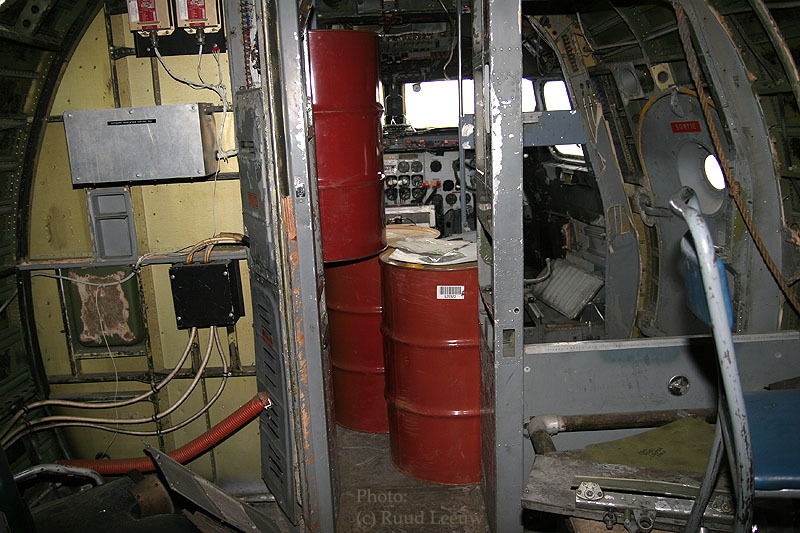 Around 1974 they moved their operation up to Detroit's Willow Run Airport. Joining Zantop, Ortner, Intermountain, Mannion, ONA, Century, and another half dozen DC-3,DC-6,C-46, the occasional Connie, operators they hauled auto parts around the country all night long!" Plymouth Leasing Company bought it 05apr74 and on that date Ortner Air Service started a lease. Trans Continental Airlines leased N9891Z in 1976 and the Detroit Institute of Aeronautics bought it on 31mar78. 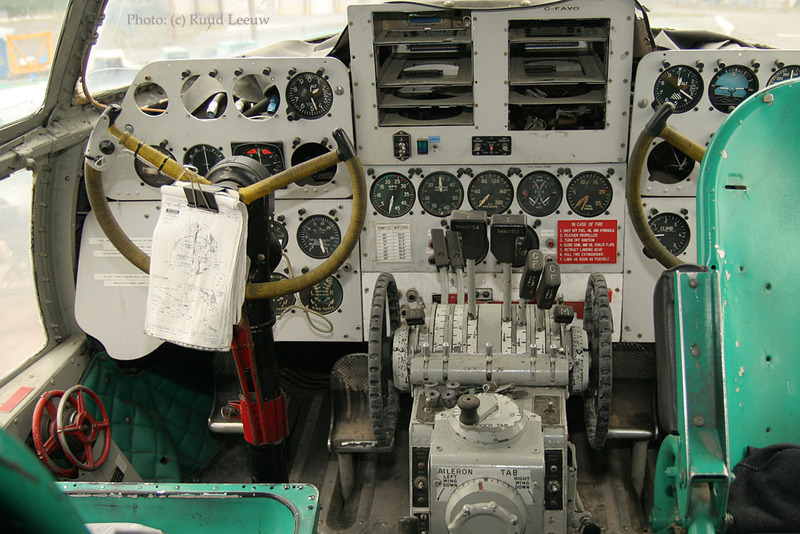 Owners continued to change rapidly: on 04May79 we see Landy Taylor Aircraft Sales making the investment of ownership, quite successfully as on 11May79 Evans Aviation Inc made the purchase. Northland Air Manitoba registered it C-FAVO on Dec87, changing their name to Air Manitoba in Dec90. 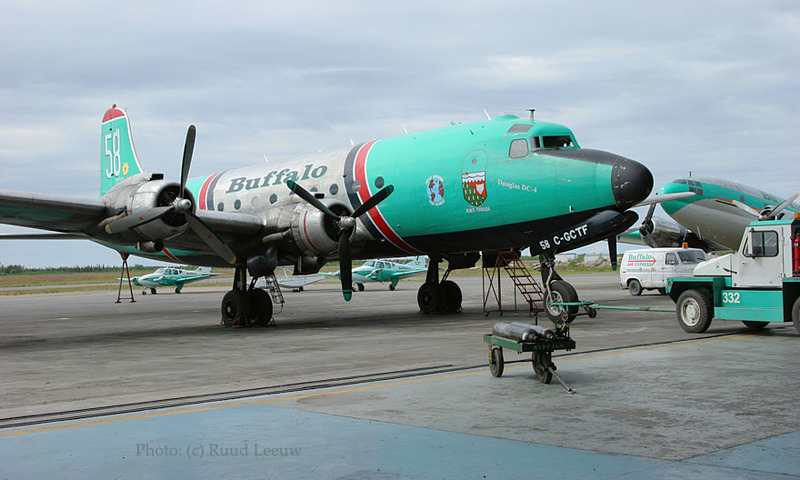 And Buffalo Airways bought it in June 1994. So good to see it operational ealry-2019, featuring in the Planesavers episodes on Mikey McBryan's YouTube channel. "Last month a friend of mine and myself made a tour to Western Canada and the Northern Territories (Yellowknife and Hay River). As a result of this trip I've generated a small list on Buffalo Joe's fleet (in ms excel) of aircraft over the last couple of years. There may be still some gaps, especially on smaller aircrafts pre 1976/77. Maybe someone can help with the missing ones in future...? 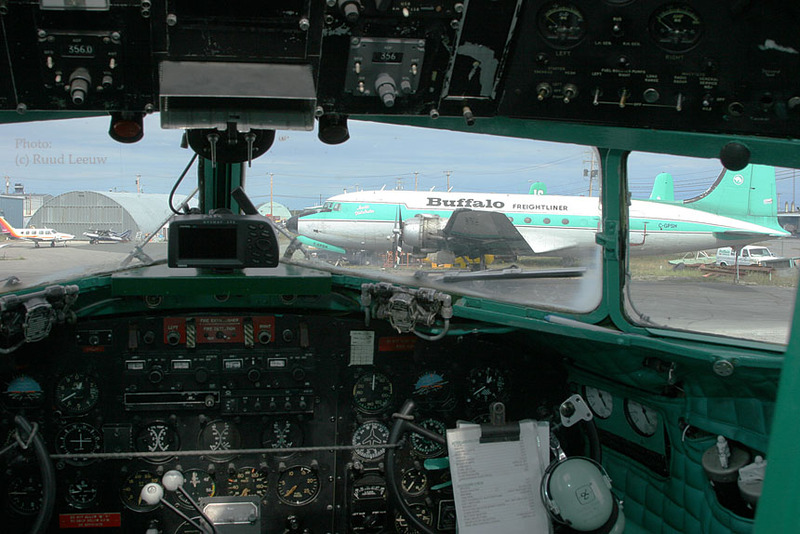 Please feel free to use this information to update your Buffalo Airways page of your visit in 2006. 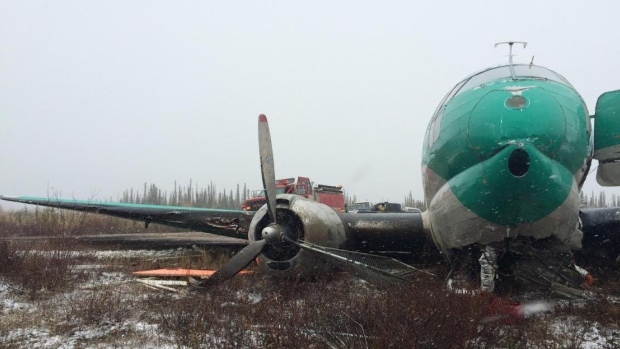 The only question we could not solve, was the source (donor) of the new tail section for C-46 C-FAVO after the taxiway accident at YZF, maybe one of the Fairbanks wrecks? 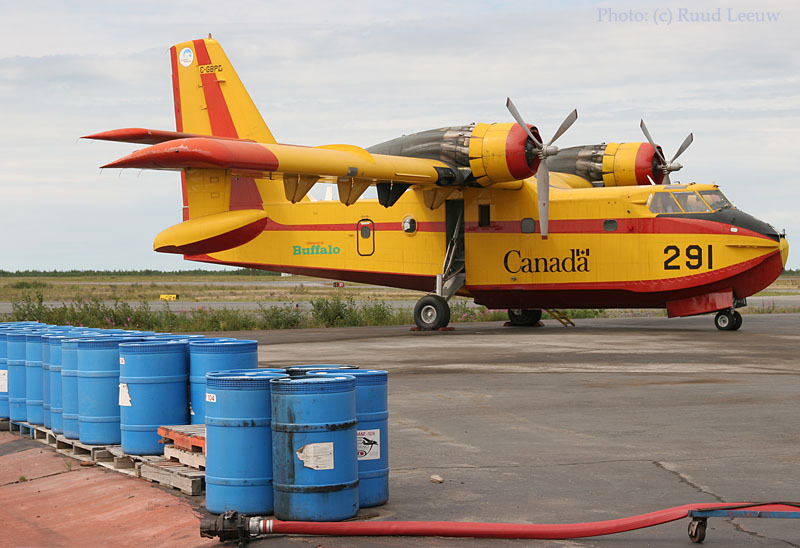 Btw, former Aero Union tanker 13 DC-4 C-FBAK is definitely at Hay River, but without engines an avoid of any registration, just the 13 on the tail..."
Checking out the airtanker base... Buffalo maintains a role in that business of aerial firefighting too. While the airtanker base seemed deserted as anything else here, I stumbled into a group who were being shown around by Gary (Law? Lord?). I was allowed to join the guided tour of friends/relatives and considered myself lucky. I knew other Canadair CL-215s have been refitted with turbo engines, so it came as no surprise to hear that these Scoopers are candidates for such modification too. 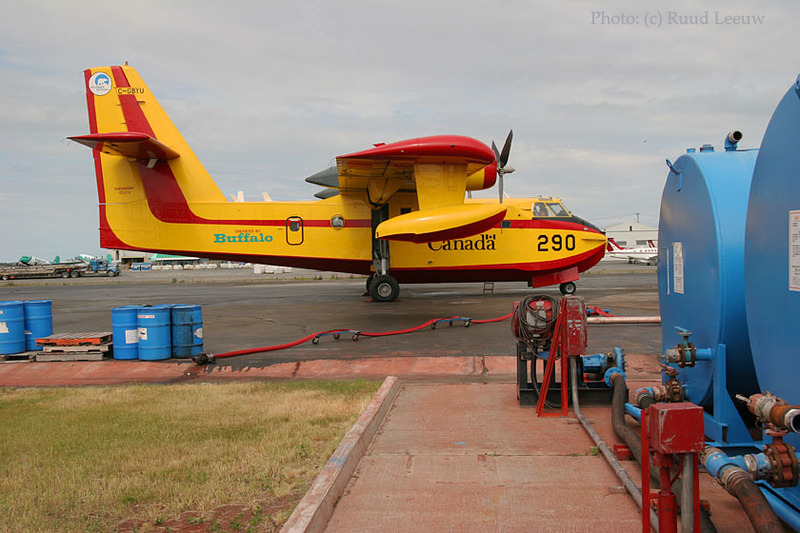 The first 2 Canadair CL-215's arrived in April 2004, bought and flown over from Croatia. C-GBPD/291 CL-215-1A10 c/n 1084, mfr 1985, registered to 11Apr00 Buffalo Airways Ltd.
C-GBYU/290 CL-215-1A10 c/n 1083, mfr 1985, registered 11Apr00 to Buffalo Airways Ltd. 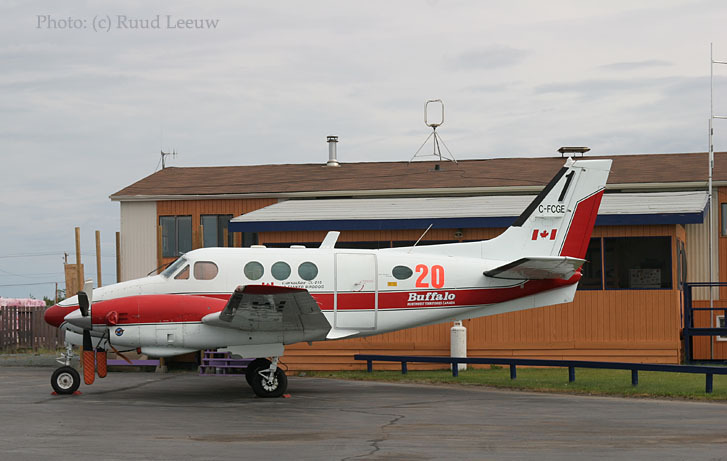 The 'Birddog' C-FCGE is a Beech 95-A90 (c/n LJ-118, manufactured 1966, registered to Buffalo Aws 10Apr03. 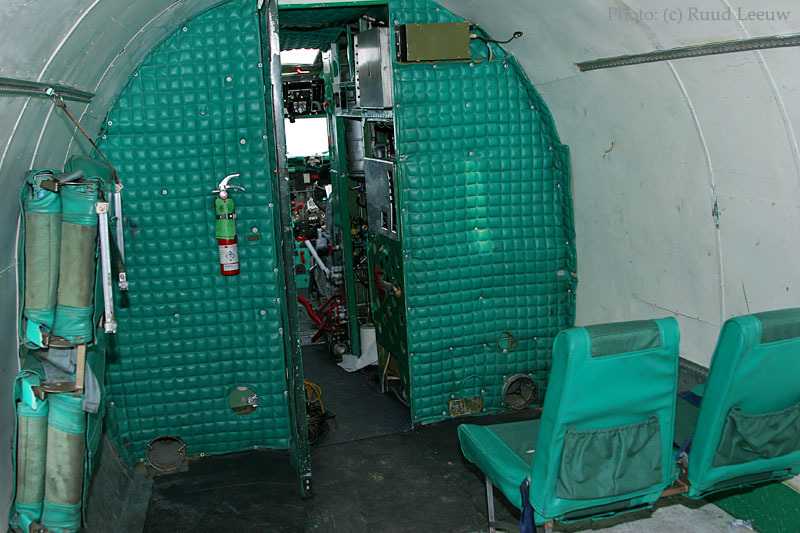 Let's have a look inside one of the CL.2015's..
UK-12002 is an Antonov An-12V with c/n 402002. Besides the large SRX titles (if it is an abbreviation I don't know the meaning) it has subtitles www.srx.aero operated by Aeroleasing (which has aircraft based in Florida). 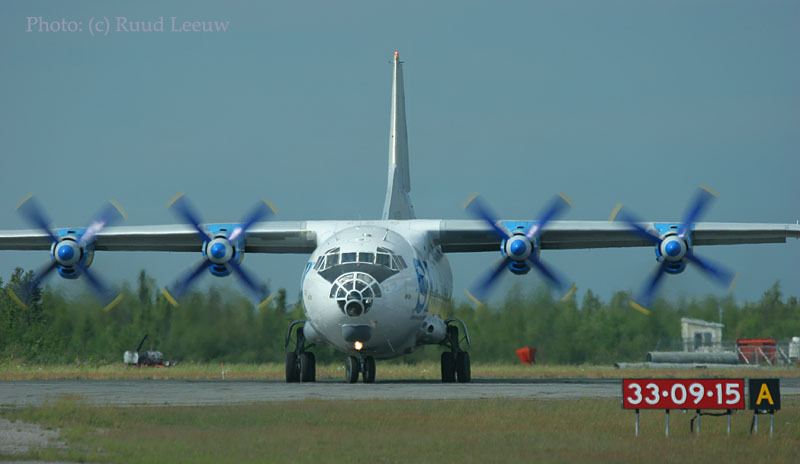 I was quite surprised to see this Antonov An-12 here and it flew from dawn to dusk! AmeriJet International (Fort Lauderdale/Hollywood and Miami) announced in 2009 its acquisition of SRX Transcontinental (Opa-locka), a Florida based company specializing in ground handling operations throughout Central Asia, and owner of Avialeasing Aviation Company (Tashkent), an Uzbekistan certificated airline with US DOT Part 129 authority. 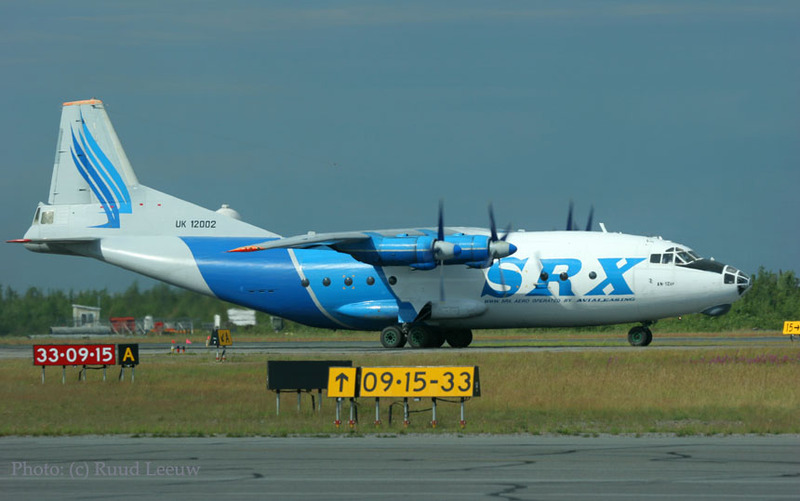 SRX and Avialeasing market the sales, charter operations, and contract maintenance of Antonov An-12 and An-26 aircraft based in both Uzbekistan and Opa-locka (near Miami,FL). N404LC is Lockheed L-100-382G with c/n 4763. It was registered on 19Nov98 to Lynden Air Cargo (of Anchorage,AK). 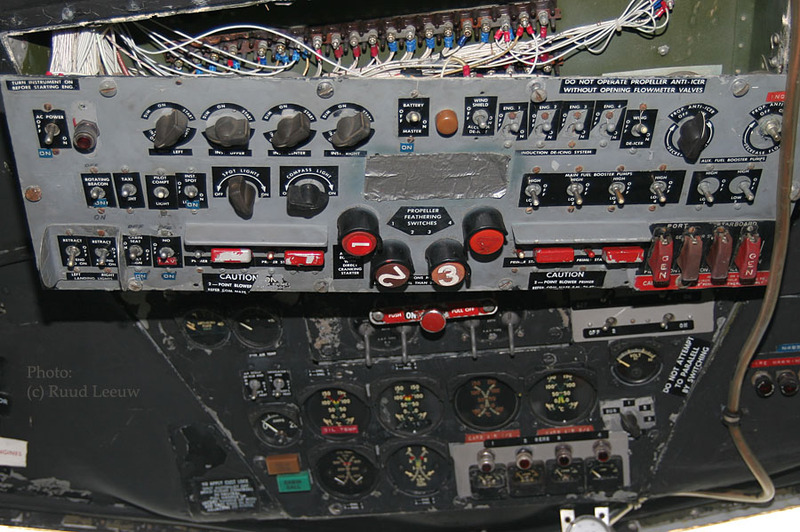 This Herc was manufactured in 1977. I saw N404LC also make numerous flights but had no way of checking their destination. As I had no car at my disposal, I did not venture to the ramp near threshold of rwy 09, where the Herc and the An-12 were handled. Next time I will get a car! With great interest I read Allan MacNutt's book "Canada's Arctic Sovereignty" (available from Mac's Aviation Books, Abbotsford,BC; fax +1 604 859-3218), describing in detail about Canada's wealth of buried resources, the bloated bureaucracy of the Territories and the culture of the northern aboriginals but also about their deplorable lifestyle. Among the many minerals to be found in the north, oil, natural gas and diamonds are the biggest news at the present time. Tantalum has been found in the Yukon and this is very valuable for surgical equipment, cell phones and computer science. A new find near Yellowknife is Bismuth and this is valuable to medicine. Other minerals could prove of great value too. Gold has been the most lucrative mineral in Canada, but will soon be replaced by energy products: gas and oil. Diamonds have caused a boom in the Northwest Territories, comparable to the Yukon Gold Rush in 1898. 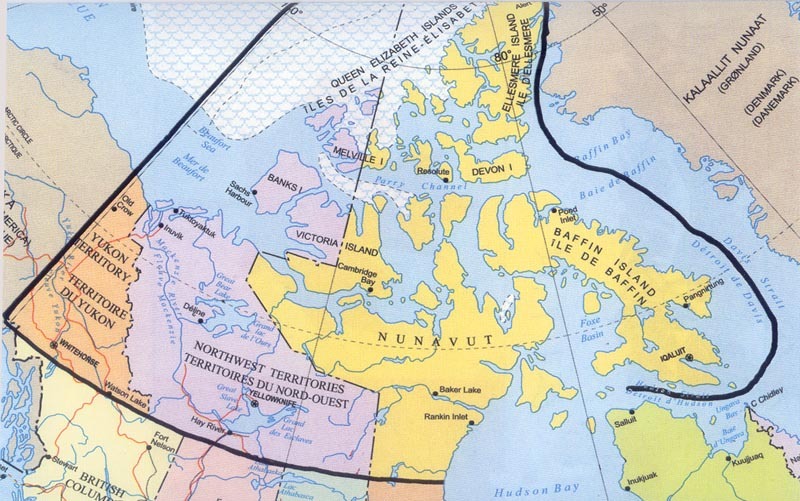 Yellowknife has shown rapid growth; it was originally developed as a gold mining area and has a highway to the south; it is now a boomtown for the Canadian diamond trade, but the Arctic North is largely an undeveloped area in terms of infrastructure (roads, seaports, etc). Many issues, including of a cultural and environmental nature, need to be adressed too. Grab and run will prove to be ruinous in the long term. Al	MacNutt is a retired pilot and the book covers many aspects of flying in these parts, too. 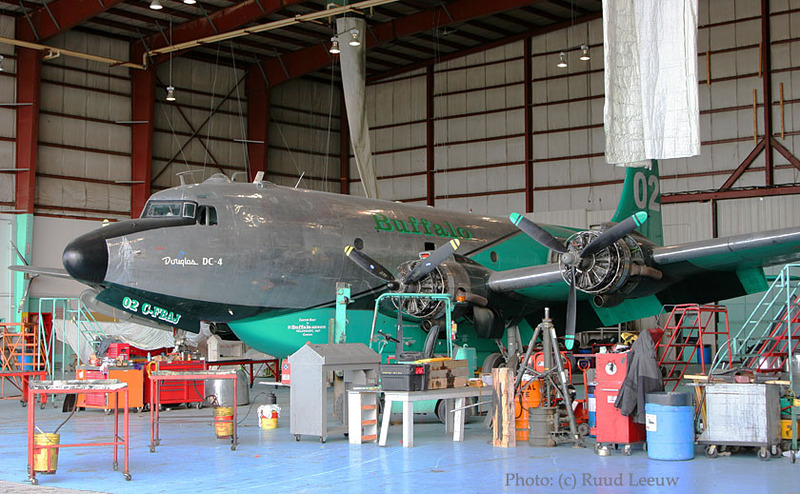 Meanwhile, back in the hangar... another look at C-FBAJ. One of the replies, on flighthours on these 'Skytrucks', I think FBAJ was considered to be at a lowly 17.000 flighthours, while GPSH (the 'Freightliner') had some 70.000 hrs on the airframe. I hope I understood these figures are correct... Will verify on some future visit! C-GCTF was again taken out by Ron, for another no.2 testrun. The only help I could offer was to put the chocks in place. Unfortunately the result was, again, not to Ron's satisfaction. I did not mind: I suffer false notes in a Radial Performance just as gladly! 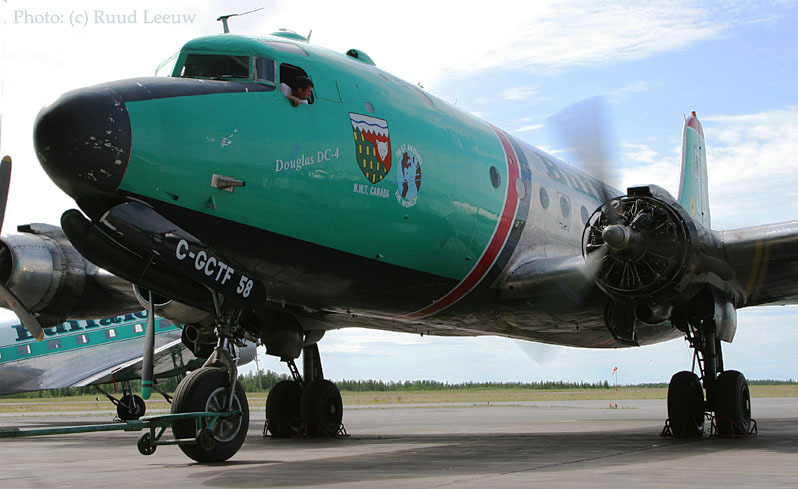 DC-4 C-GCTF of Buffalo Airways, spouting smoke! Ron McBryan checking the rumbling pistons, not yet quite satisfied with the harmony there.. While C-GCTF was towed back in the hangar, the sun appeared briefly and I decided to call it a day too. I considered my disappointment two days ago when I faced the absence of 'Buffalo Joe', the lousy weather at first, the lack of operations versus the bounty of photographs, my clambering up and down these aeroplanes, the hospitality here... and I found the sun warming my mood and satisfaction too! The next morning I showed up at the airport for my Canadian North flight to Edmonton, connecting to my Martinair flight to Amsterdam, only to find Canadian North had advanced the schedule to such an extend that I had missed the flight! In the end it wasn't all bad as Canadian North payed a big chunk of the costs I suffered in this and I met someone in Vancouver whom I can forever call a friend! So this long trip ended somewhat unorganised, with some considerable mood swings but this trail was concluded on a high note! 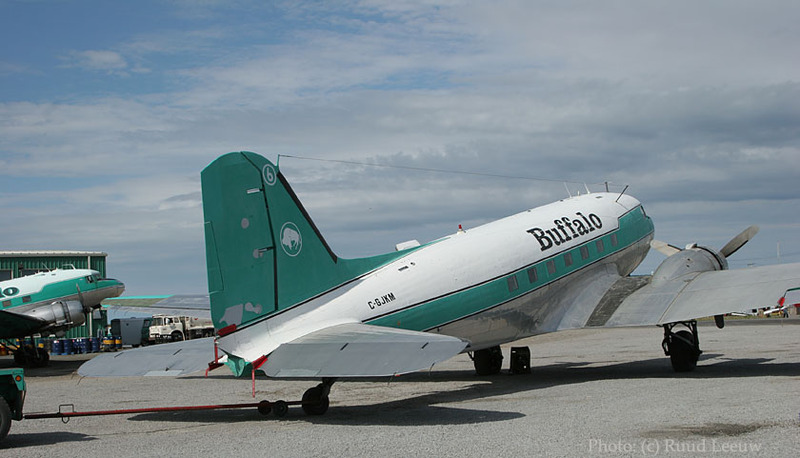 As per 01Jan07 the Transport Canada online database (broken link, may 2014) gave 45 records of Buffalo Airways aircraft currently on the Canadian Register; mind, some aircraft may still be owned by Buffalo Aws but due inactivity taken off the Register: e.g. 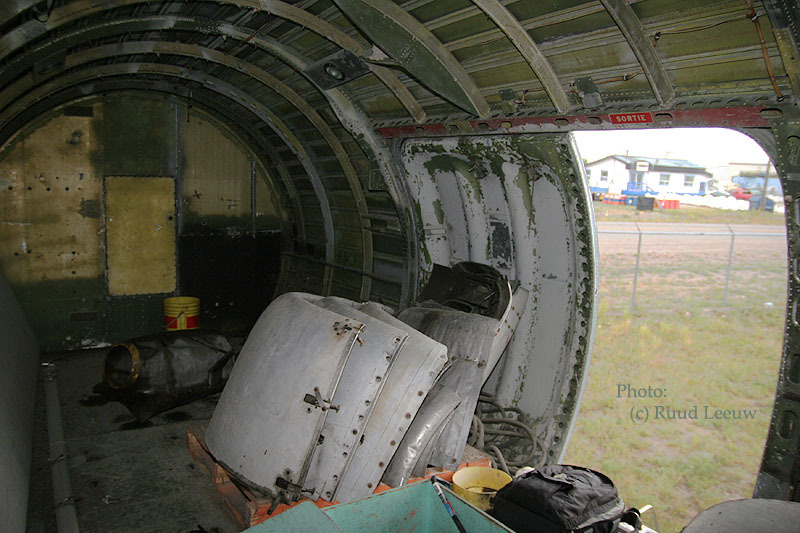 C-54 C-FBAK was reported at Hay River during May06, but is not on the Register. I am indebted to the unlimited hospitality displayed by the staff of Buffalo Airways and my heartfelt thanks go to Ron McBryan and Mike Handley for their time, patience and generosity ! Back to My visit to Yellowknife... Day 1 ! 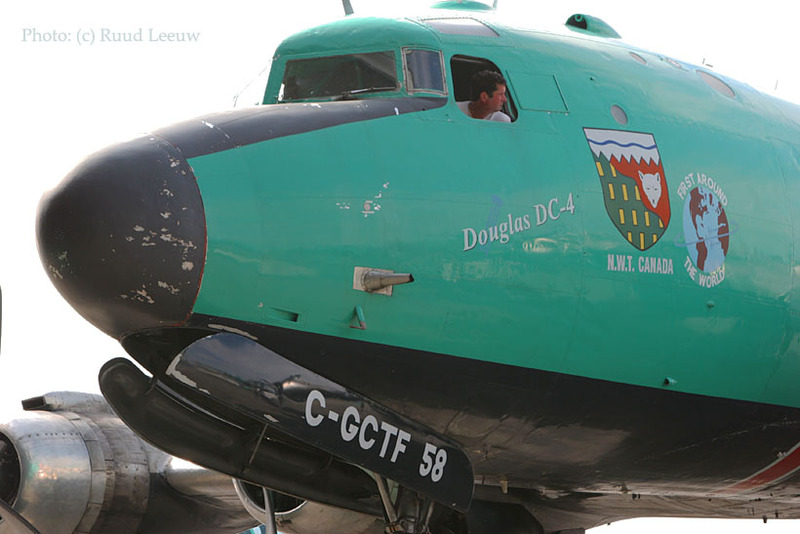 Registration : C-GXKN Operator : BUFFALO AIRWAYS LTD.
A06W0002: The Buffalo Airways Ltd. Douglas C54G-DC, registration C-GXKN, operating as flight BFL1405, had departed Norman Wells at 16:52 MST. Six minutes later, on climb-out, the crew declared an emergency due to a fire in the number 2 engine (Pratt and Whitney USA R-2000). At the time the fire was discovered, the no. 2 engine stopped due to internal damage. The fire bottles were discharged with little result. 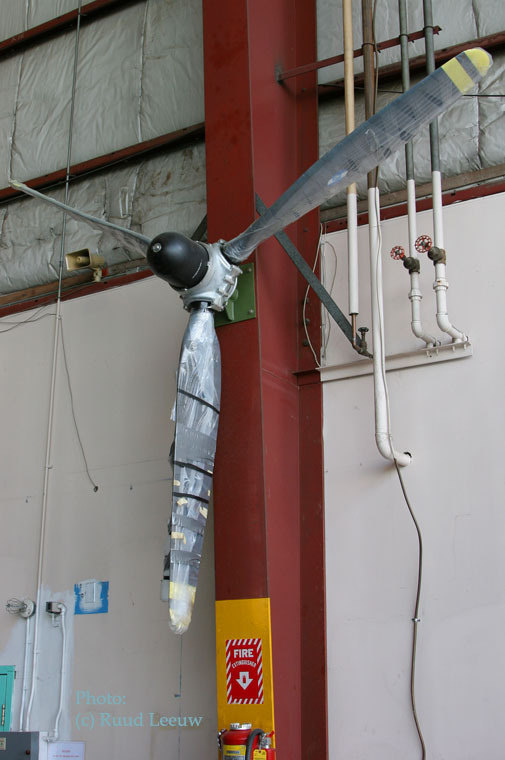 Coincident with the feathering of no 2 propeller, the no 1 propellor auto-feathered while the engine was at climb power. 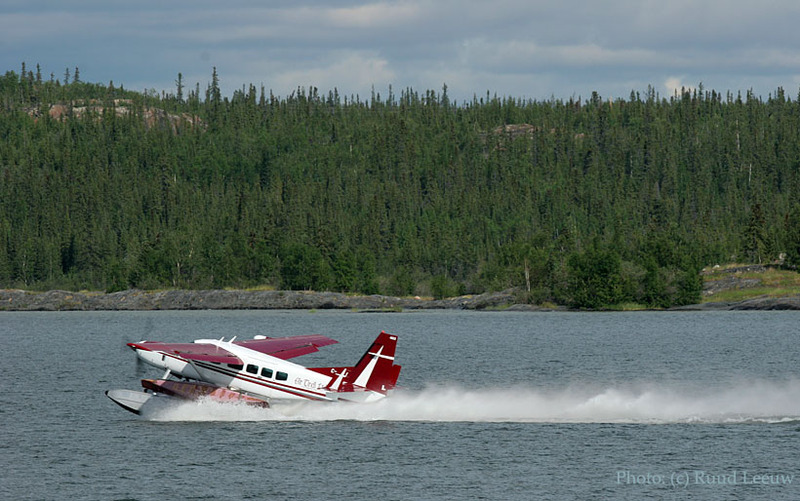 The crew were planning an emergency off-field landing when the fire extinguished, and the flight returned to Norman Wells for an uneventful 2 engine landing at 17:04. Normal braking was not available during the landing roll and emergency braking was applied. The aircraft departed the runway surface and came to a full stop in deep snow approximately 60 feet from the edge of the runway. 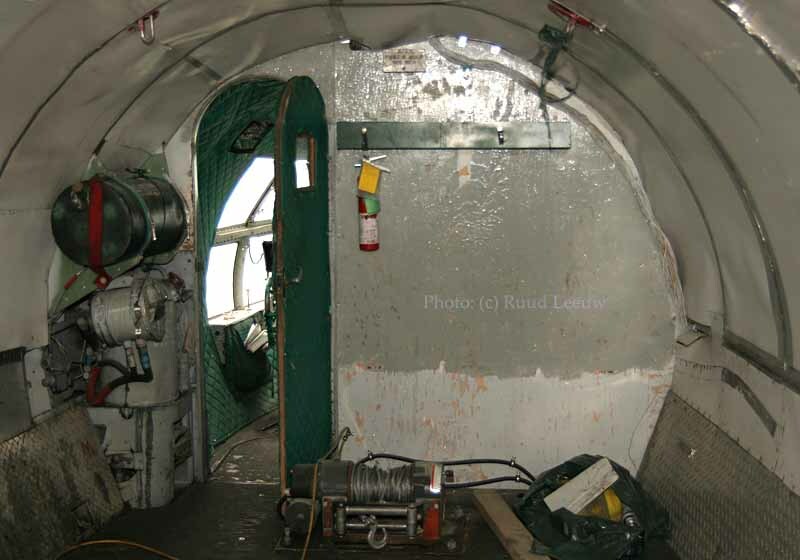 The aircraft sustained substantial fire damage but there were no injuries to the four crew members on board. GXKN made the way back to Hay River in Oct.2006 in true bush-style: by river barge! However, C-GXKN did not get the chance to return to airworthiness, as it was used to repair damage on C-GPSH at Carat Lake... Images on my page Photos by Friends & Guests, page 8. 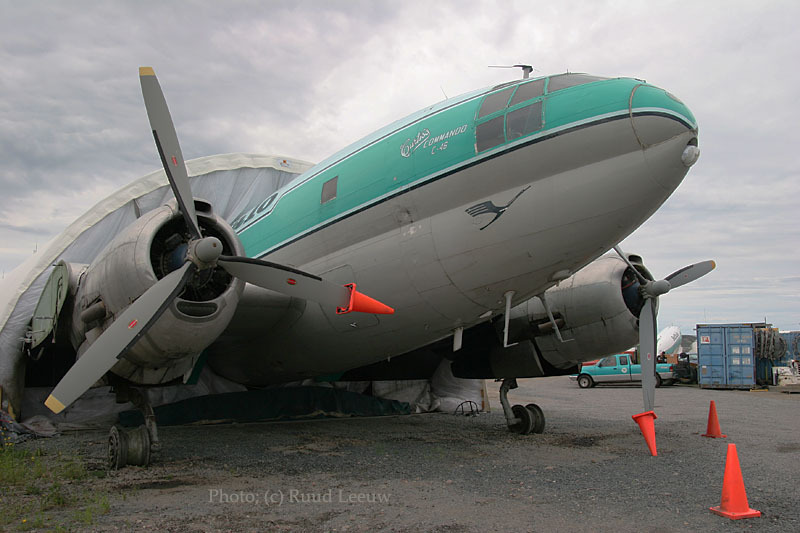 This Buffalo Airways vintage transport, a WW2 Curtiss C-46 Commando (of which Buffalo has two) with 4 crew members crash-landed while making for an emergency landing in Deline, N.W.T., on Sep. 25th. Initial reports showed that nobody was injured in the incident. It seems there was an engine problem and the C-46 while fully loaded has great difficulty staying in the air on one operating engine. 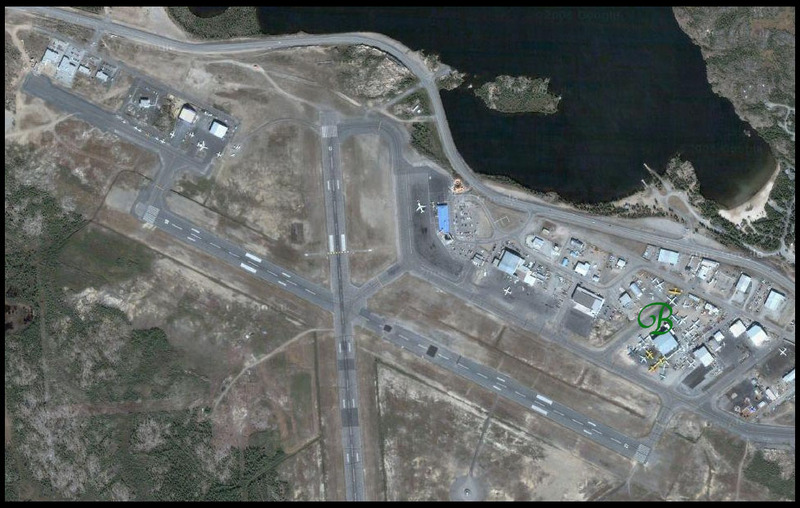 So it diverted to the airport at Deline, but ran out of altitude shortly before reaching it. 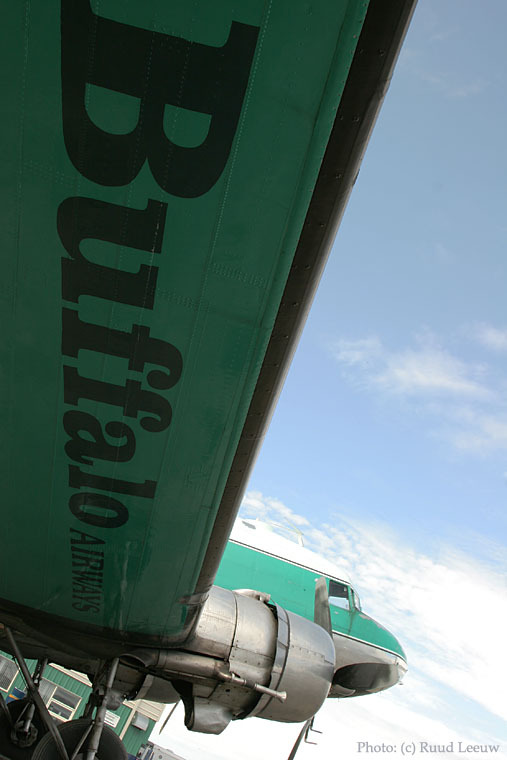 "Transport Canada has grounded the operations of Buffalo Airways, the popular northern airline chronicled over six seasons on TV's Ice Pilots NWT, due to safety compliance issues." 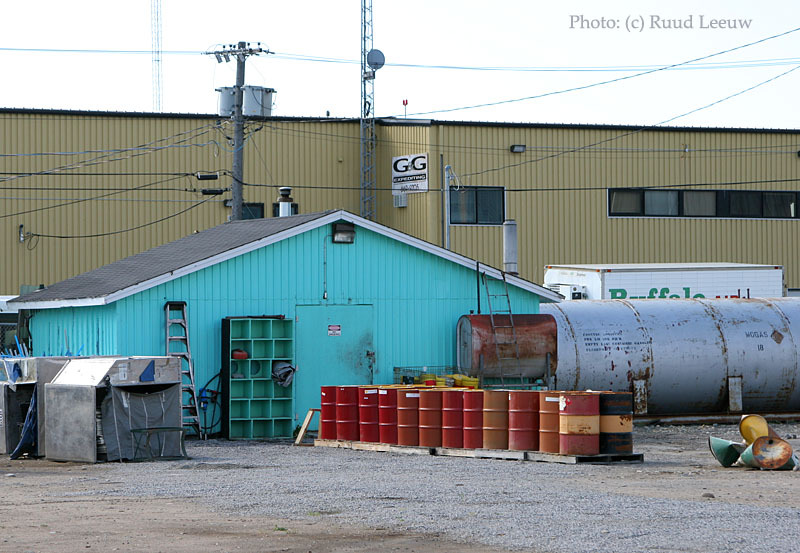 The Hay River-based company was notified around 4 p.m., Jan. 12 (2016) by the regulator that the suspension issued Nov. 30 had been lifted, said Bruce Jonasson. A spokesperson with the federal department did not immediately return a request for comment. During the six-week suspension, the company was prohibited from flying. To maintain service, it hired chartered flights for cargo and passenger service. However, on Dec. 24, the company ended chartered passenger flights to Hay River. 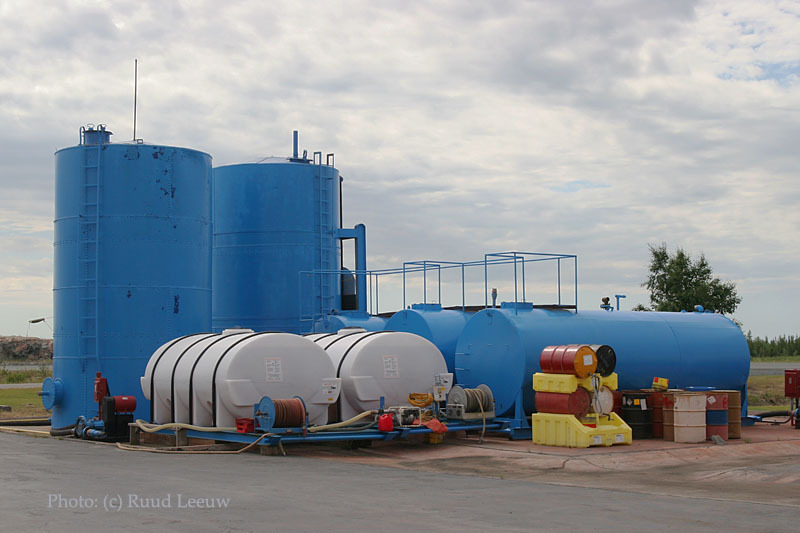 The company's cargo flights will be the first to resume service within days, Jonasson said. "The passenger service to Hay River is on hold for the moment," he said. That's because the company won't immediately be able to jump back into regular operations. The company also hired Sol Taboada with DTI Training as a consultant to help address issues raised by Transport Canada. In a news release last year, the department said it acted because of the company's "poor safety record." 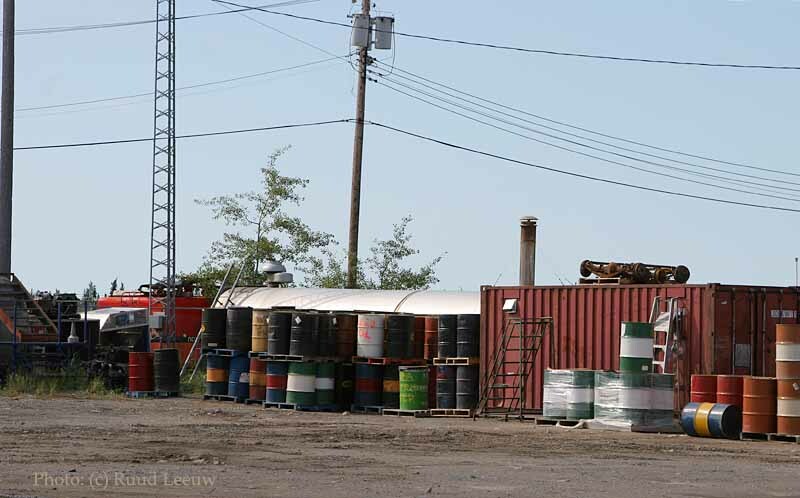 Jonasson said the company worked hard to address the corrective actions required by Transport Canada. During the suspension, Jonasson said the company was still paying its employees. "It's been awful over the Christmas season," he said about the impact on staff. He estimated the financial impact was in the range of $1.5 million. Buffalo being tightlipped as usual). 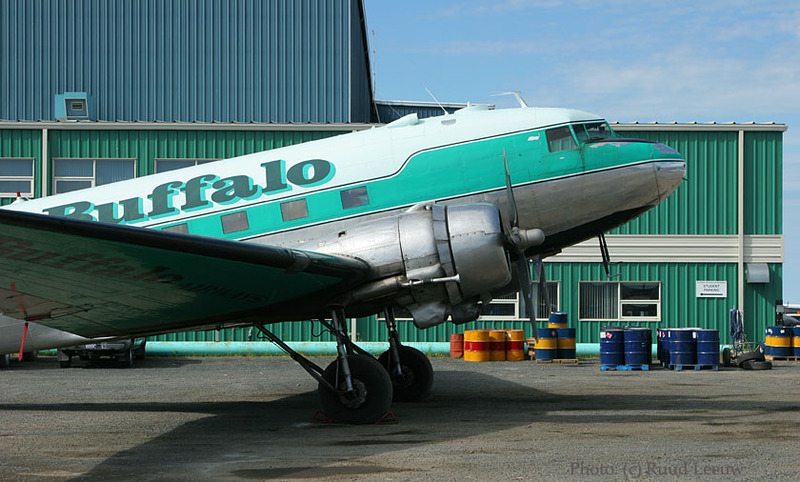 In march 2017 I came across "Canada's Buffalo Airways ends regular DC3 pax ops" (dated 15Mar2017) on www.ch-aviation.com/ but I could not read the news item due lack of a 'pro account'. 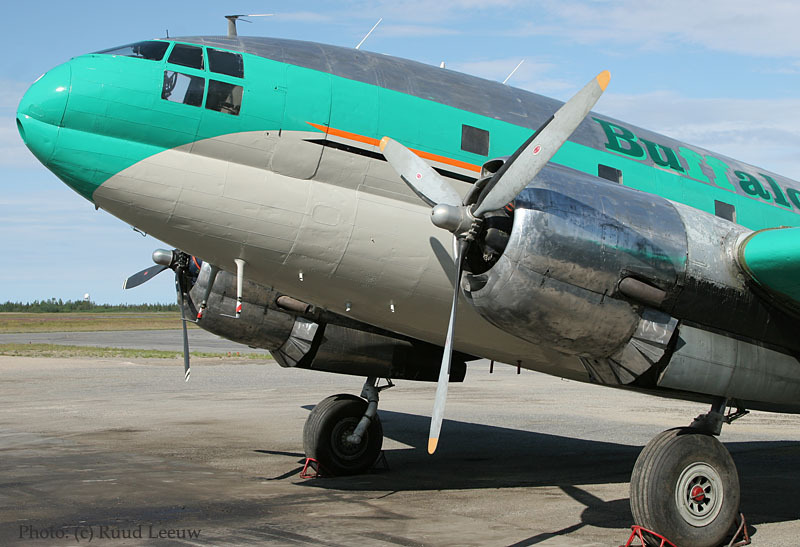 The Buffalo Airways website stated at this date (15/3/17) "All Passenger service has been temporarily postponed, sorry for any inconvenience." 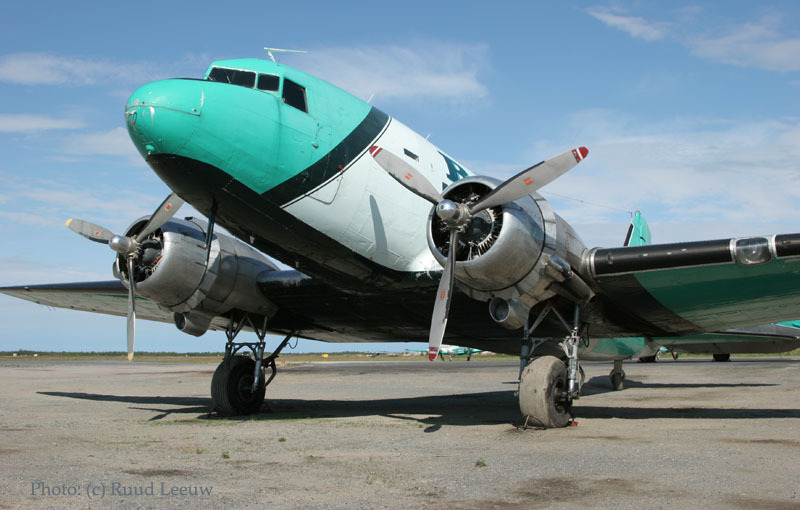 A rather terse quote from Mikey McBryan was relayed to me: "For the moment there are no passenger DC-3 flights planned and not for the foreseeable future. The current business model does not allow it. 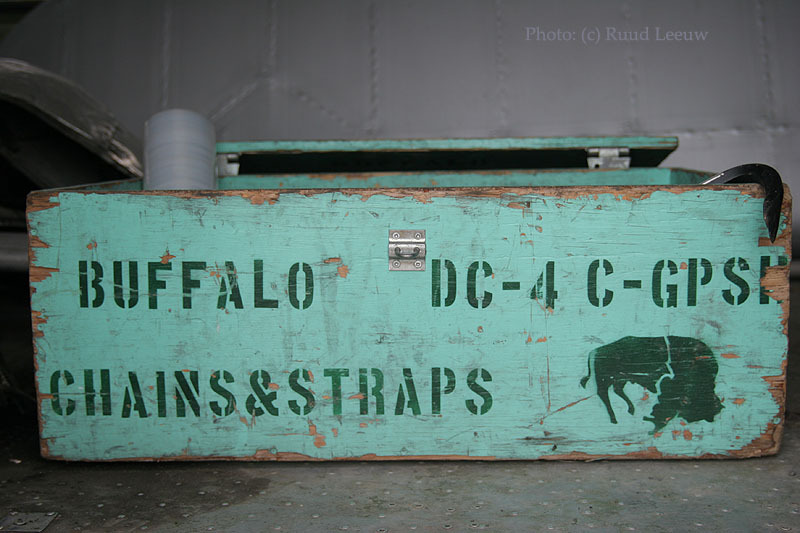 Buffalo Aws has currently (March 2017) three cargo DC-3s online for the daily freight schedule."